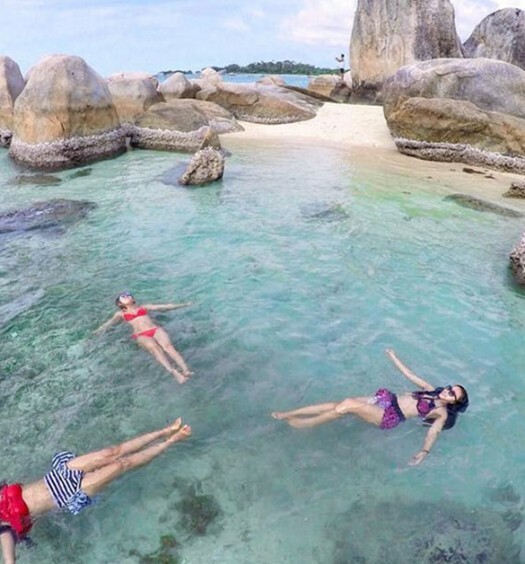 4D3N Best of Belitung itinerary for pristine beaches, island hopping, fresh seafood and spectacular scenery! 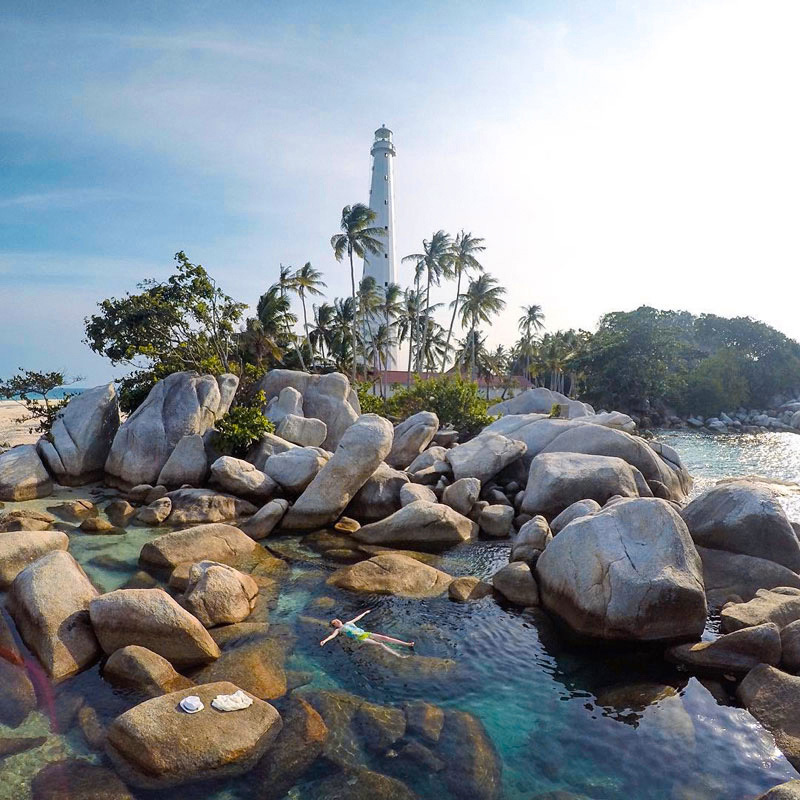 Indonesia > Sumatra > 4D3N Best of Belitung itinerary for pristine beaches, island hopping, fresh seafood and spectacular scenery! Long weekend? School holidays or simply a treat? Time for an island getaway somewhere close by! We want something with great weather, nice beaches and unique places to explore! 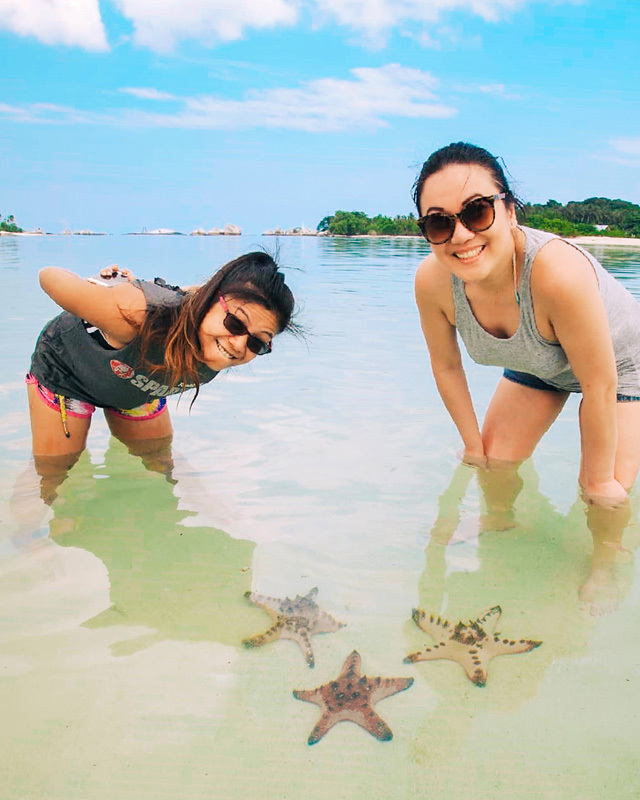 Does that sound like what Batam and Bintan has to offer? Oh no, not again!! See and do what others have not! 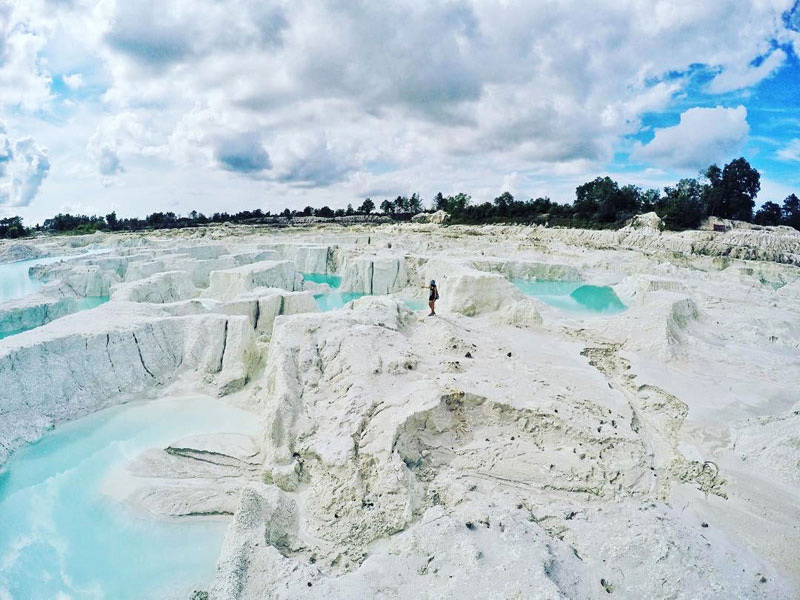 You will definitely want to skip Batam’s usuals when you get to know that a mere 2-hour flight can take you to a cluster of lesser-known exotic islands – Belitung! 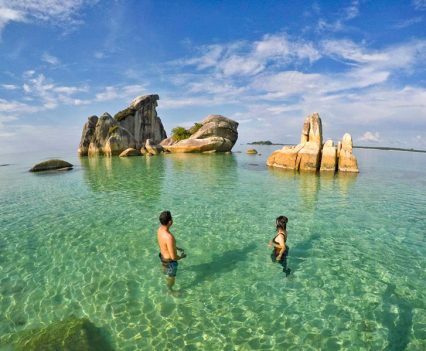 With pure and pristine beaches, Belitung is gaining exposure and is now ready to welcome tourists with attractions, landmarks and resorts! The main island is surrounded by numerous offshore islands with matching charm and beauty! Don your swimsuit, but also your greed and hunger for seafood because this 4D3N itinerary to Belitung will be a feast for both your eyes and stomach! 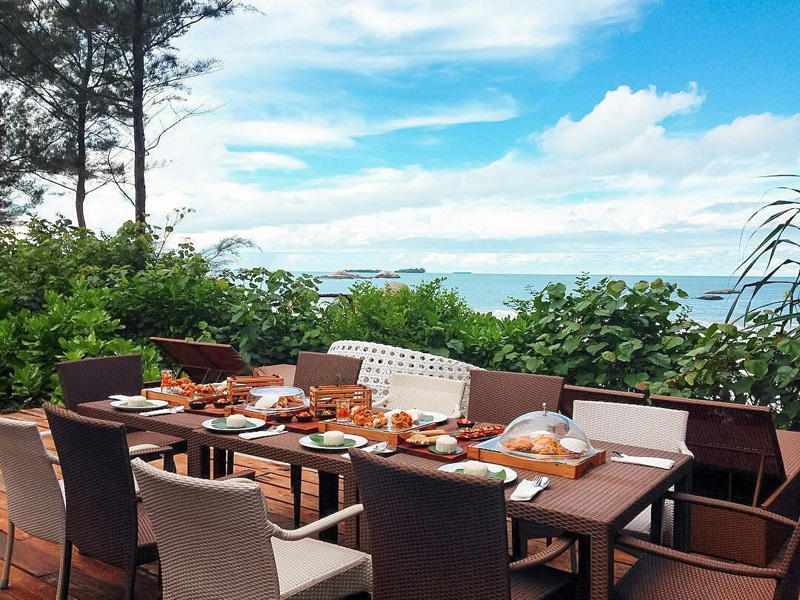 Just picture your next seafood feast by the beach… rhymes with perfect island getaway doesn’t it?! 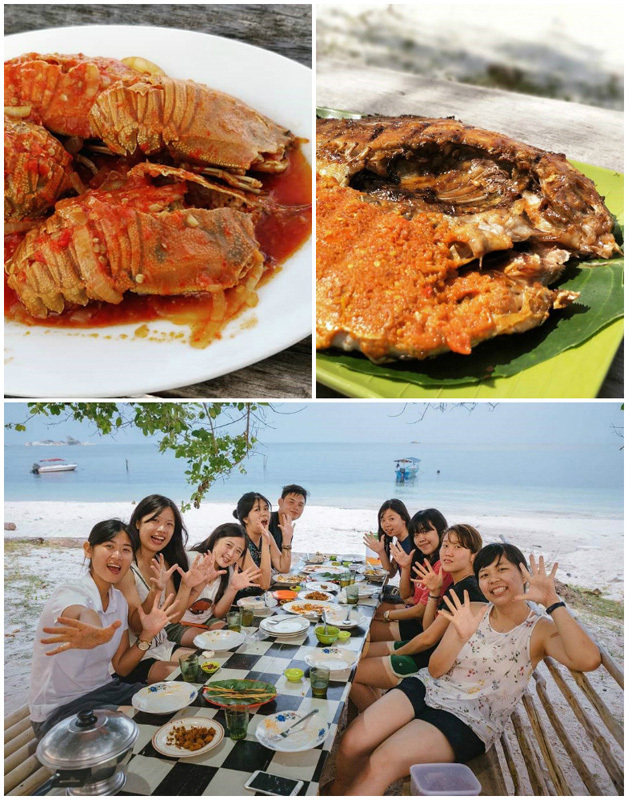 From your very first day, you will get to discover the island’s expansive coastlines, natural sceneries hosting fascinating cultures and communities, roadtripping to unusual places but also mountainous feasts of seafood – all these in just 4 days! 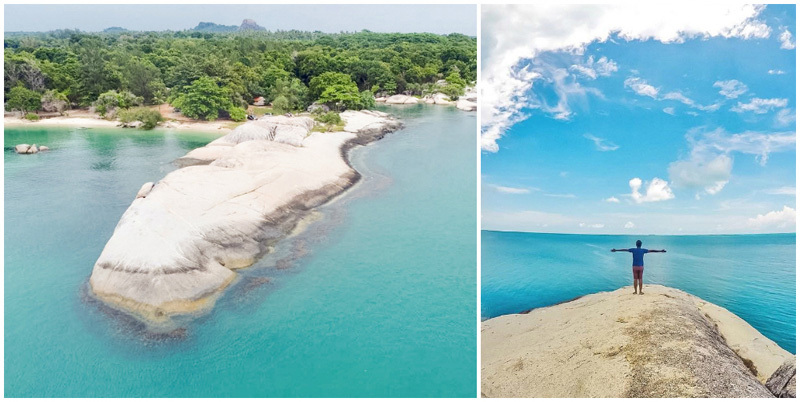 It is the perfect place for beach enthusiasts looking to escape from busy Batam to explore hidden gems! 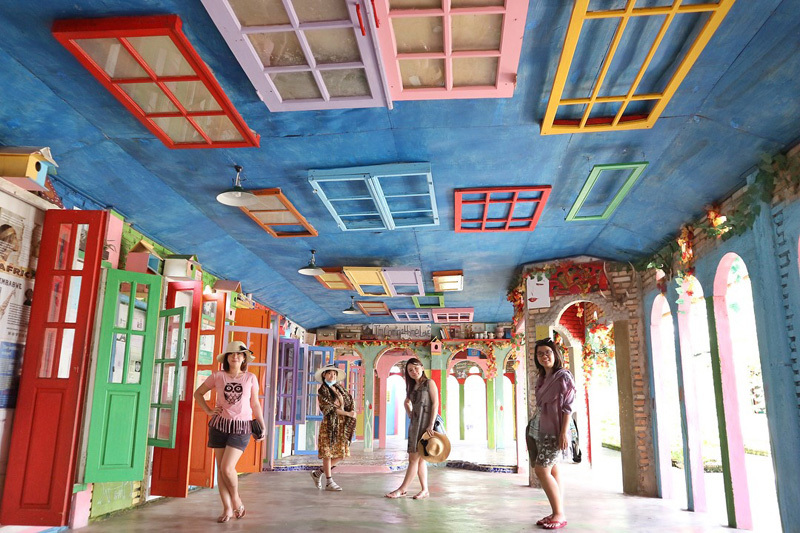 Your getaway also covers unique souvenir shopping and great coffee stops you are bound to remember! Day 1: Eat and do like the locals from West to South! Day 2: Hop, Hop, Hop from one island to the next! Day 3: Road trip to the East for spectacular scenery and best views! Day 4: Souvenir shopping and a century old coffee shop stop before leaving! Tigerair, Scoot, Jetstar, Lion Air, AirAsia, Garuda Indonesia, Singapore Airlines to Jakarta Soekarno-Hatta International Airport. Flight duration: 1 hour 45 minutes. Return flights from SGD $151. 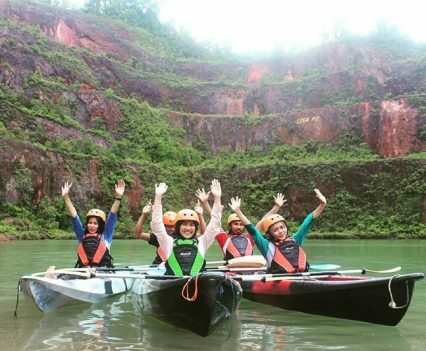 This story would not have been possible without the support of Indonesia Tourism Board. 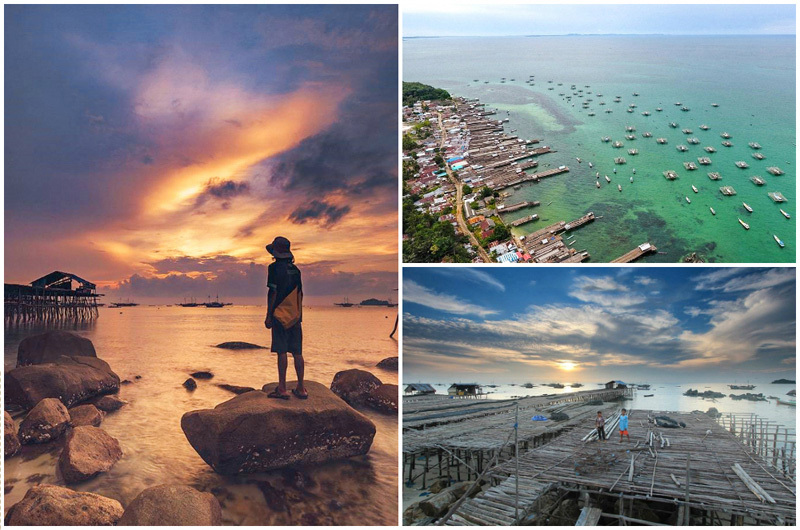 For more information, check out Belitung’s official website. 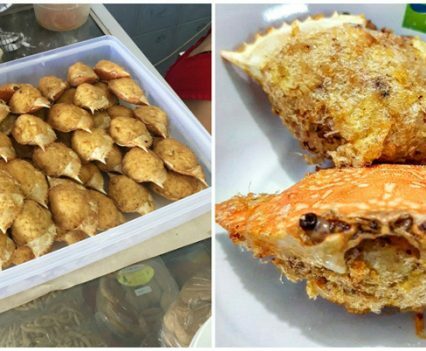 Eat and do like the locals from West to South! Once you’ve gone through the whole airport shenanigans (we are not fan of these too), you can finally kick back and relax at this underrated paradise! YAY to your long awaited getaway to somewhere new! After all, don’t we say “Once a year, go somewhere you’ve never been before?” Bet you have been patiently waiting for that moment to come! 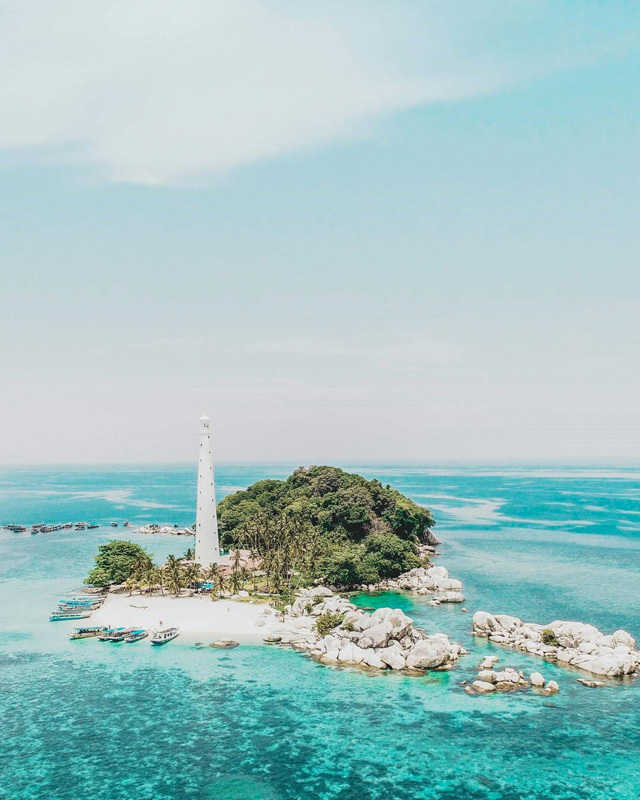 Dive into Belitung’s local way of life, enjoy your first day by venturing your way through natural attractions that make this island oh-so very special and end it with a memorable dinner with great ocean views and the freshest sea-to-table meals! 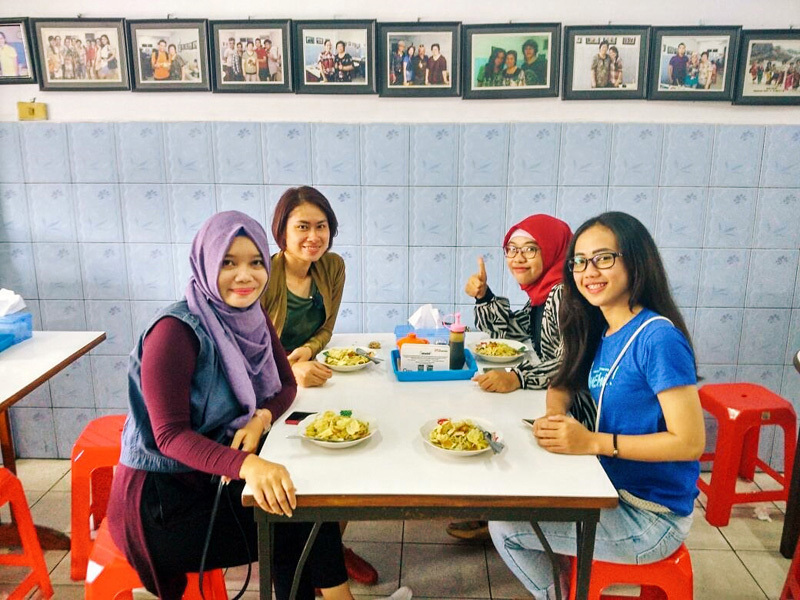 Tucking into flavourful Indonesian food should be part of your holiday while in Belitung and this is how you start your first day on the island! 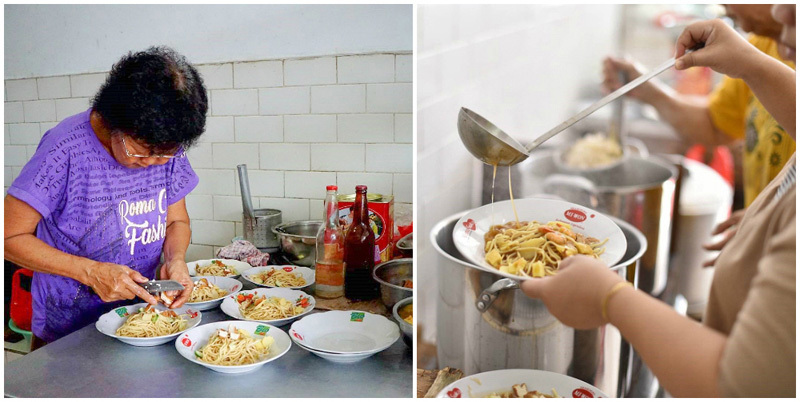 Strive to find a seat and indulge in their sweet shrimp homemade noodle soup – a must-try on the island (based on locals’ recommendation!). 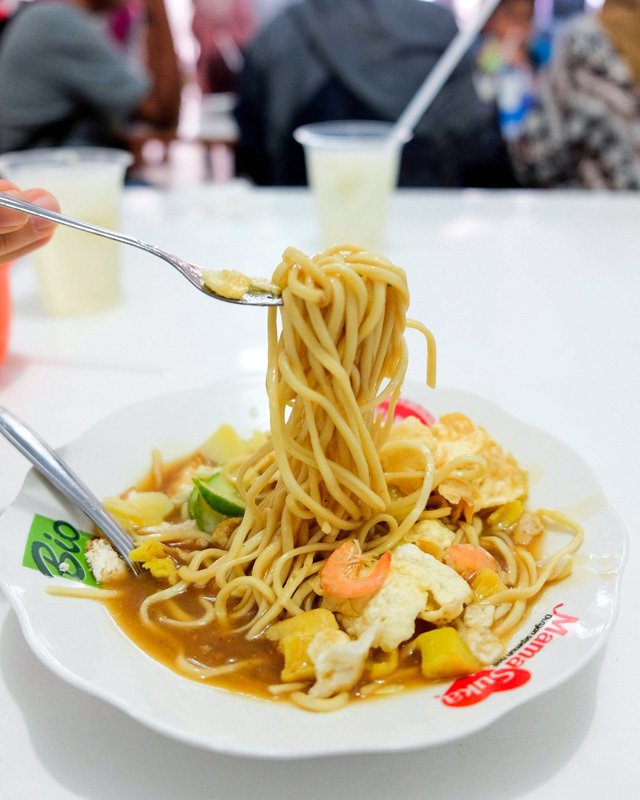 Expect a delicious concoction of sweet broth, yellow noodles, potatoes, fried shrimps, bean sprouts topped with crispy crackers. Their stuffed crab shells are a big hit too! 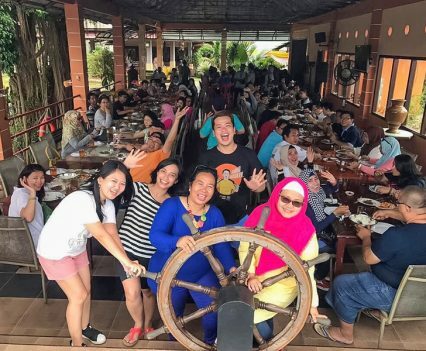 Fun fact: It’s so popular that even celebrities have dined there! 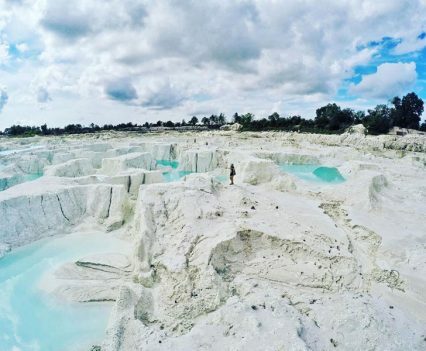 You should expect the unexpected while travelling around in Belitung as the island has been blessed with unique and surreal natural attractions such as the famous Danau Kaolin. 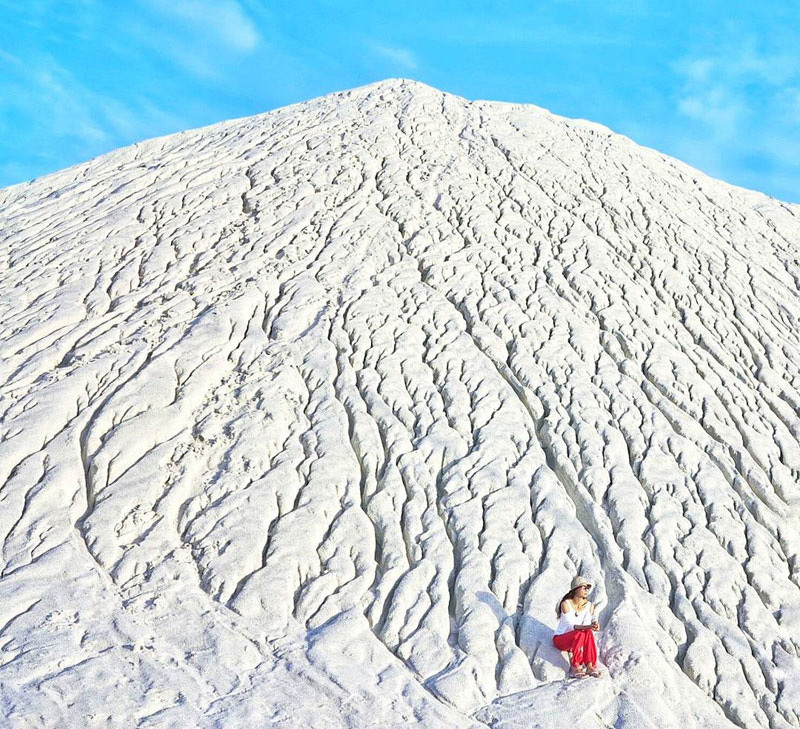 This cotton castle is the result of past mining activities that have transformed the surroundings into a real phenomenon. 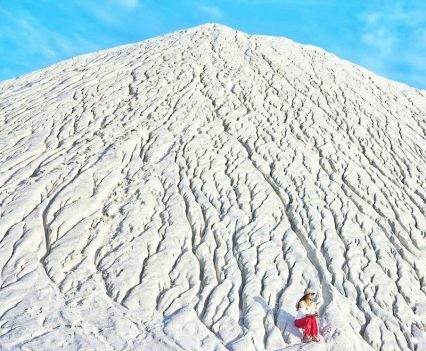 You are bound to fall for the gleaming all-white landscape, beautified by milky blue waters where you simply pose with as a backdrop! But no swimming is allowed! 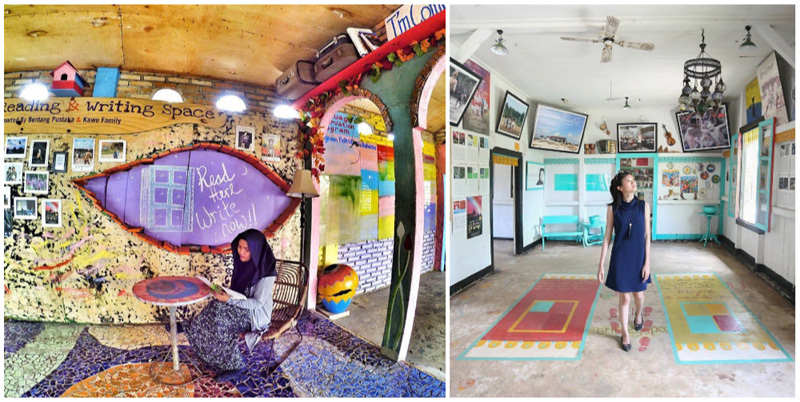 Getting there: The lake is only a 10-minute drive away from the city centre of Tanjung Pandan. 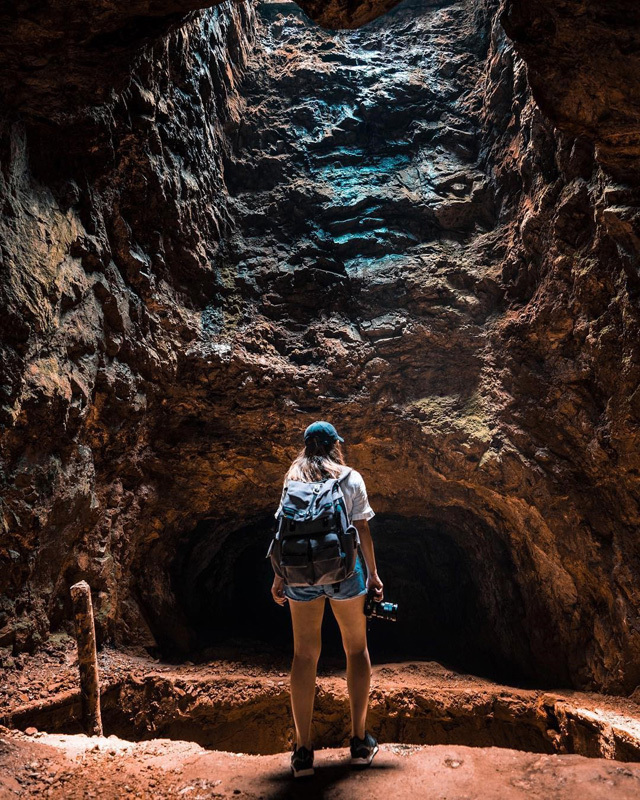 Tip: This is not an official tourist attraction, so please do not expect facilities to be available, as the place has not been developed for visiting purposes. 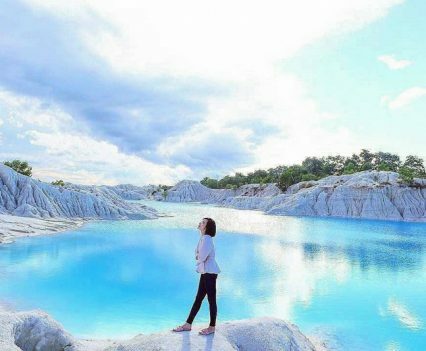 While in Belitung, you won’t have to head to a luxury hotel to enjoy a swoosh in a beautiful infinity pool because guess what? 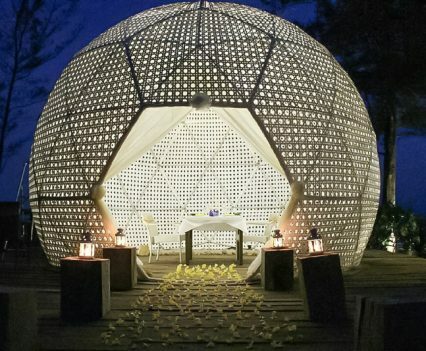 !Nature has created one in the middle of lush greenery and it is one that is hard to compete with. 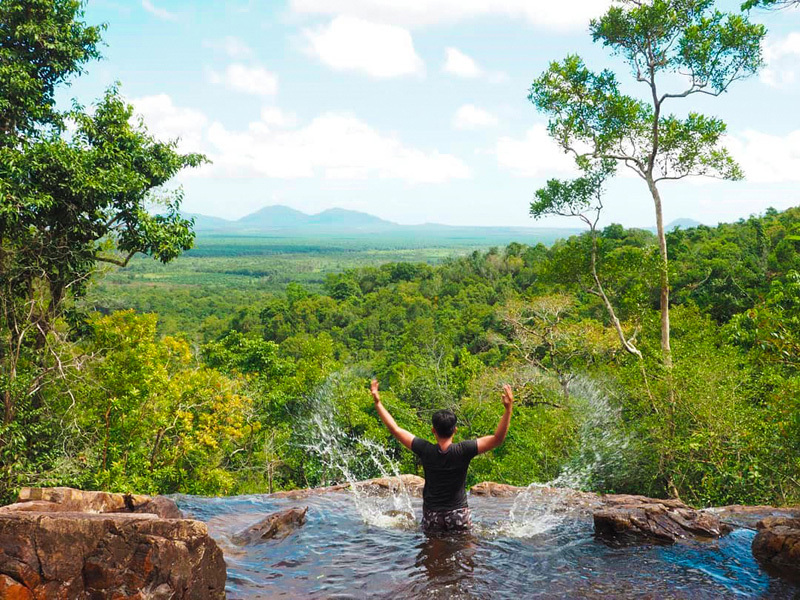 Fit for the faint-hearted, this 10 minutes trek is perfect for couples, families or anyone looking to unwind from the worries of daily life. 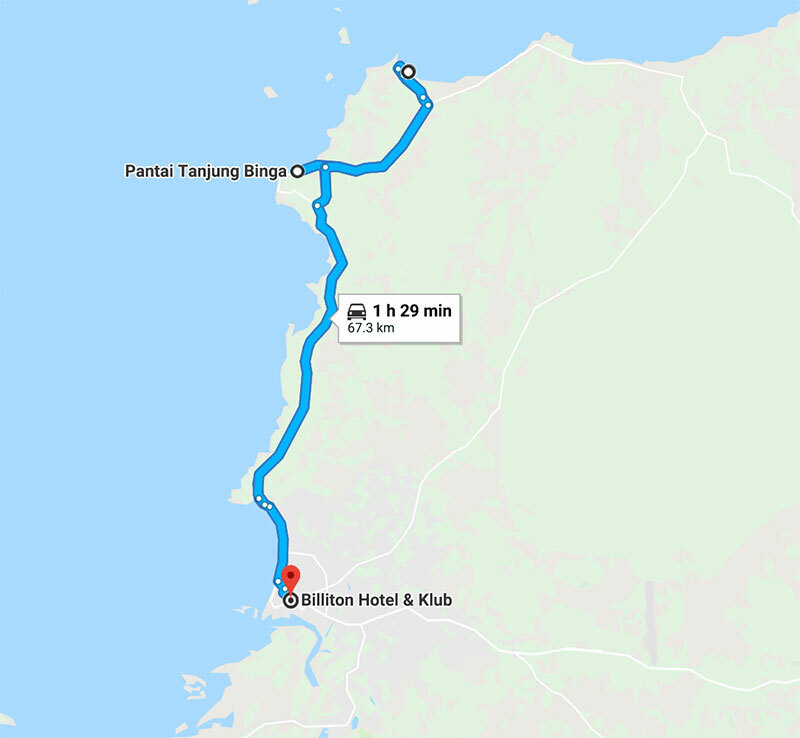 Getting there: It is approximately 40 km from the city centre of Tanjung Pandan. There is casi nada to do at this beach and this is one of the main reason you have to drop by there! 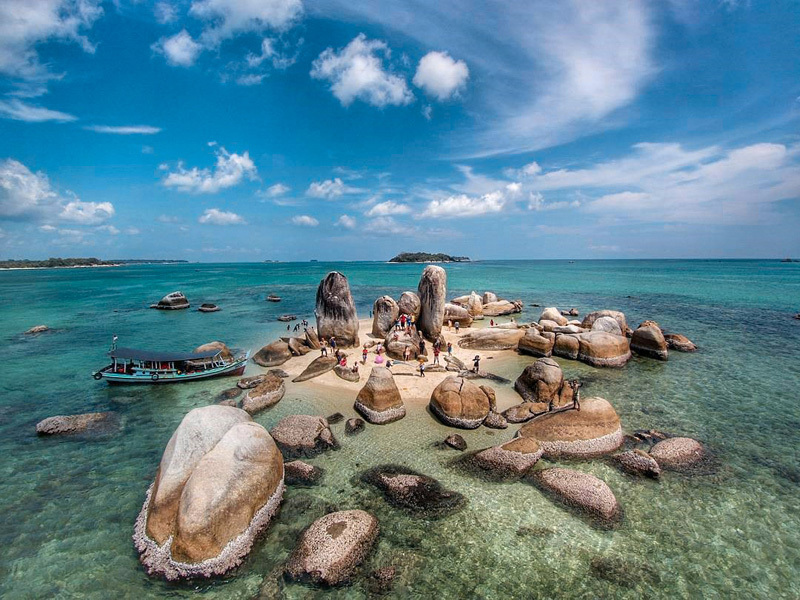 Tranquil, serene, outlined by white sand and dotted with giant granite formations, this beach features numerous trees that make it perfect for an afternoon in the shade. 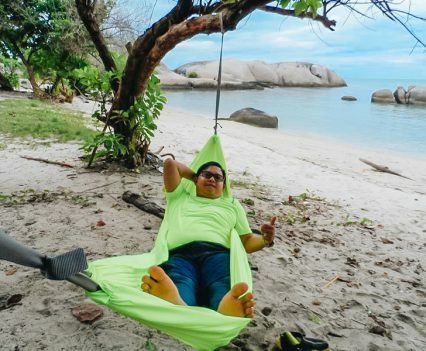 Bring along a hammock so you can enjoy it gently swaying between two trees as a turquoise sea laps the shore. And why not pack a picnic basket too, filled with items for a toes-in-the-sand evening? We like the idea! 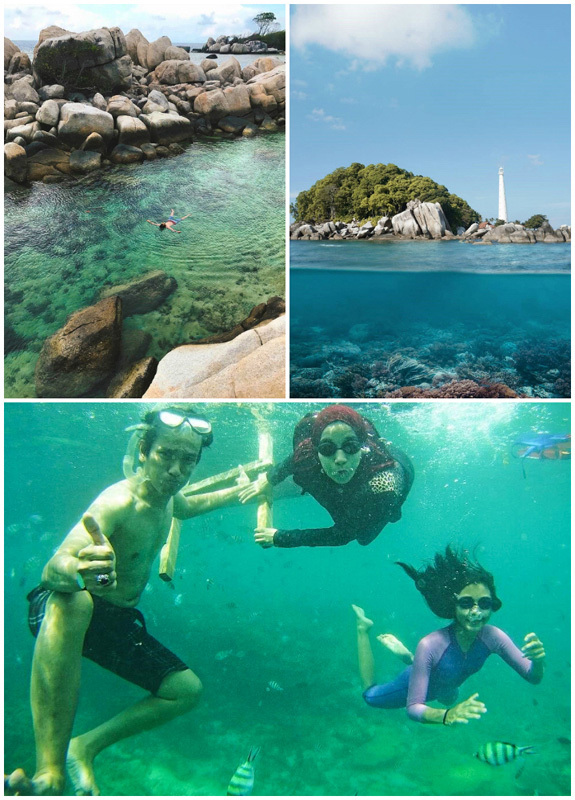 Getting there: The beach is a 1h30 mins’ drive down south of Belitung from Tanjung Pandan city centre. 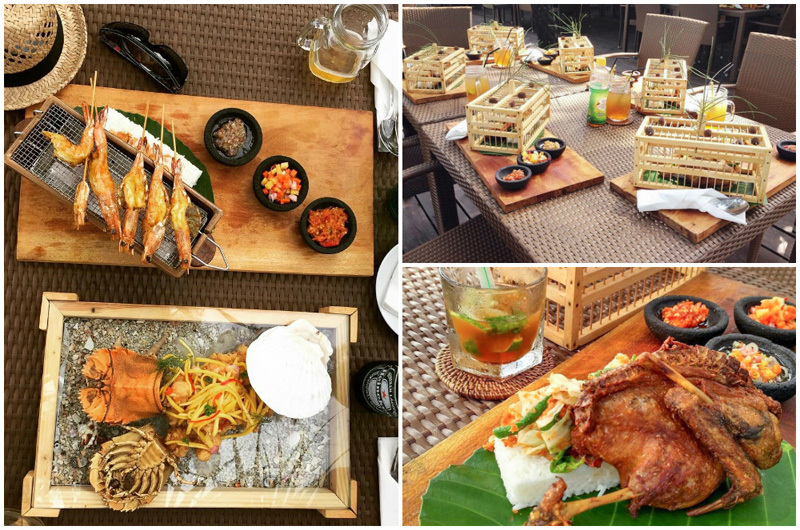 After a day filled with adventure, it’s time to drop your anchor at Sahang Beachfront Café & Resto for an early dinner. The restaurant unites the freshest produce and puts in so much dedication in the presentation of its dishes. Overlooking ocean views, visitors haul in a mouth-watering variety of meals but the chef’s recommendations (which also happen to be guests’ favourites) include the Bird in a Cage – choice of chicken or duck seasoned with 10 Indonesian spices and guaranteeing an explosion of flavours as well as the Mango Zori Ebi – freshly caught prawn topped with Seliu Mango, presented on a seashore decorated plate. Check-in at your hotel and K.O! That’s it! 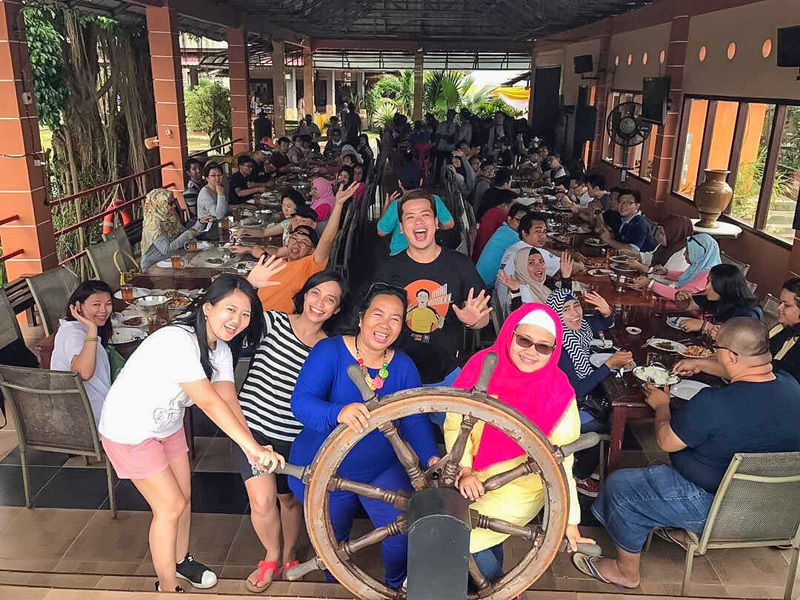 You’ve seized and wrapped your first day in Belitung, well done! Time to recharge with a deep drowse. See you tomorrow! Hop, Hop, Hop from one island to the next! 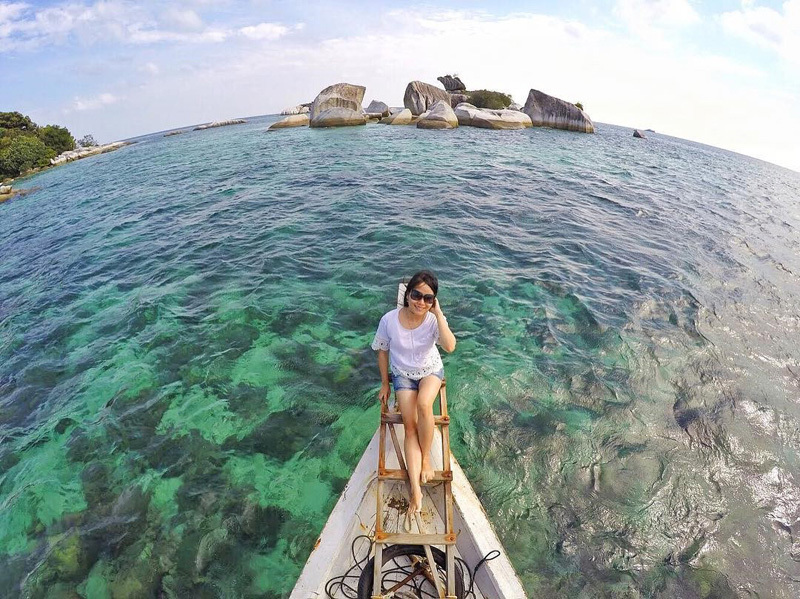 There’s no better way to spend a day than boating from island to island, and Belitung could not be better placed for island hopping. 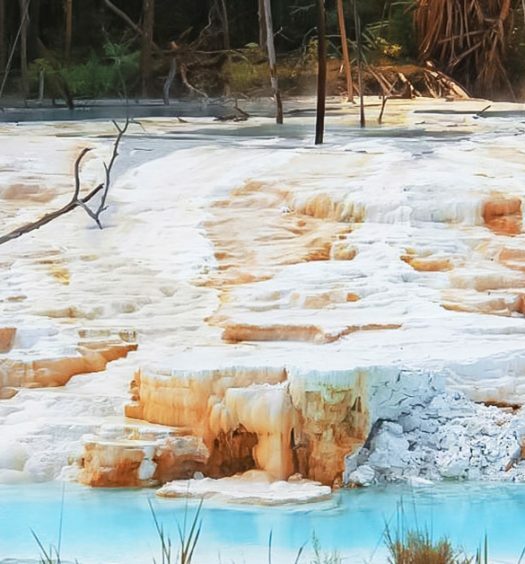 Why visit one spot when you can see many different landscapes in a single trip? 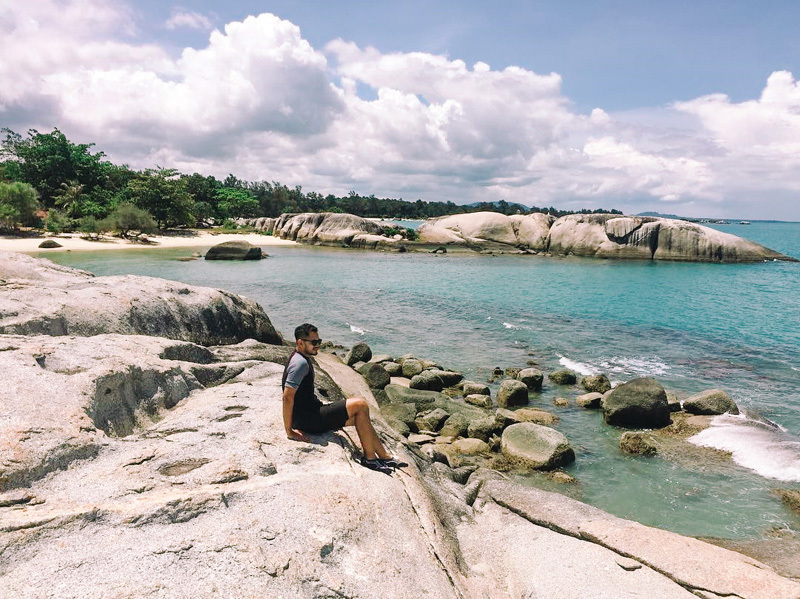 With sublime beaches at every turn and the most relaxing of vibes, it’s no surprise that Belitung island hopping is bound to be on beach lovers’ bucket lists. 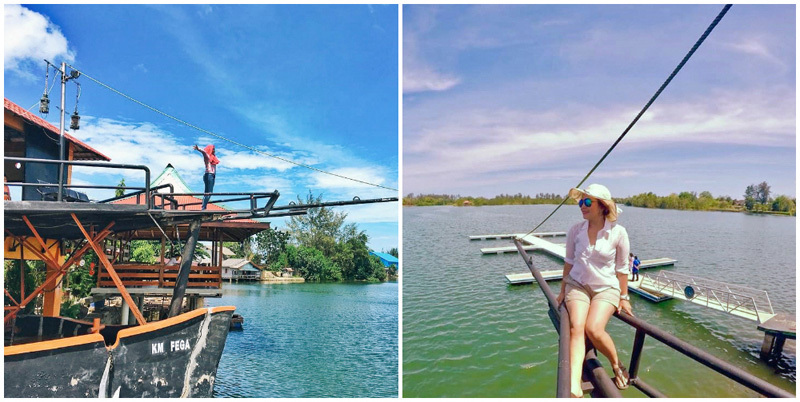 After a hearty breakfast at your hotel, head to Tanjung Kelayan and board a boat for your day out island hopping! 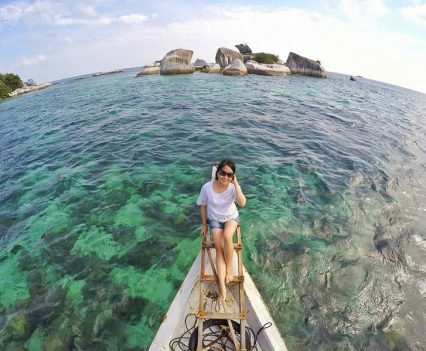 At Tanjung Kelayan, simply charter a private boat or share it with other visitors. But you might want to do all necessary bookings prior to your tour (we recommend at least 2 days before to ensure boat availability). 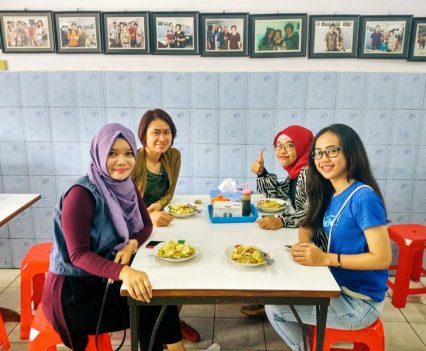 Tours are sold on a “per person per day” basis and the more people you manage to gather, the cheaper it is (approximately USD $24 per person per day for tour of 15 pax). While most tours offer lunch as part of their packages, you might want to opt out and pack your own (bring and share anyone?). While you may customize your tour to your liking and interest; please note that some of the islands proposed below have admission fees for conservation and preservation purposes (Rp. 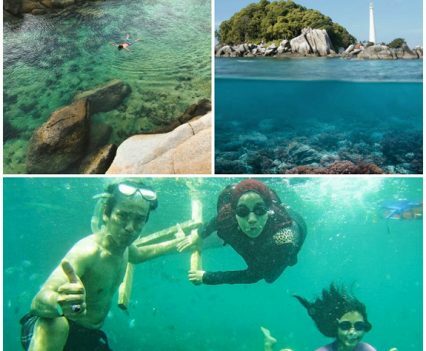 5,000 per person for Pulau Lengkuas; Rp.15,000 per person for Pulau Babi). Hop on board if what you are looking for is a balance of exhilaration and relaxation, adventure and pampering! 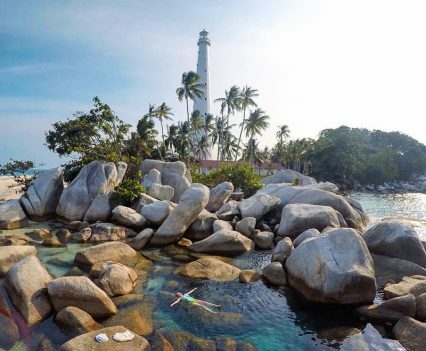 Adorned by an iconic lighthouse built in the 1880s, Pulau Lengkuas is not only a charming island of majestic beauty but it’s also part of Belitung’s history. 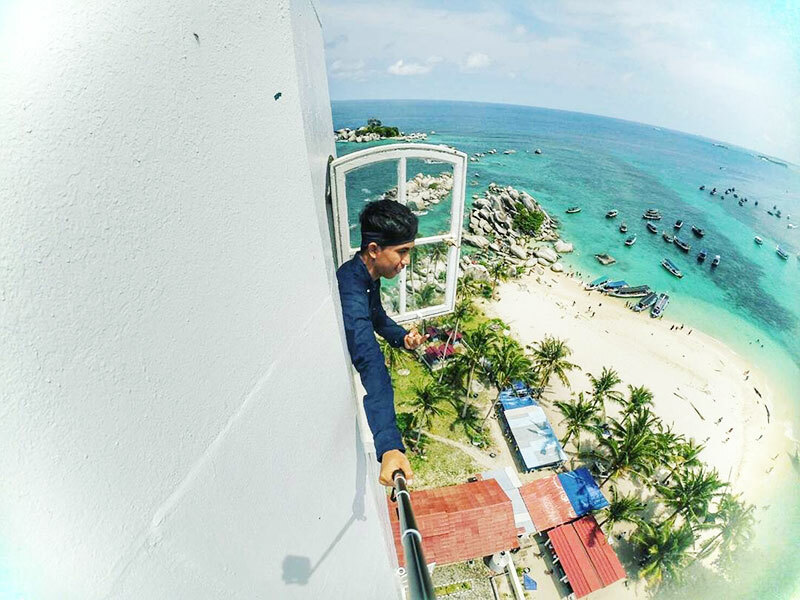 Head up the lighthouse via its spiral staircase and be greeted by an ultimate 360-degree view of the azure water surrounding this fascinating island. Though you are only allowed to reach till the third floor (out of 18), the view is still mesmerising. Not a single skyscraper to obstruct the view! Breathe in the freshness of the sea, and breathe out the cares of the day! 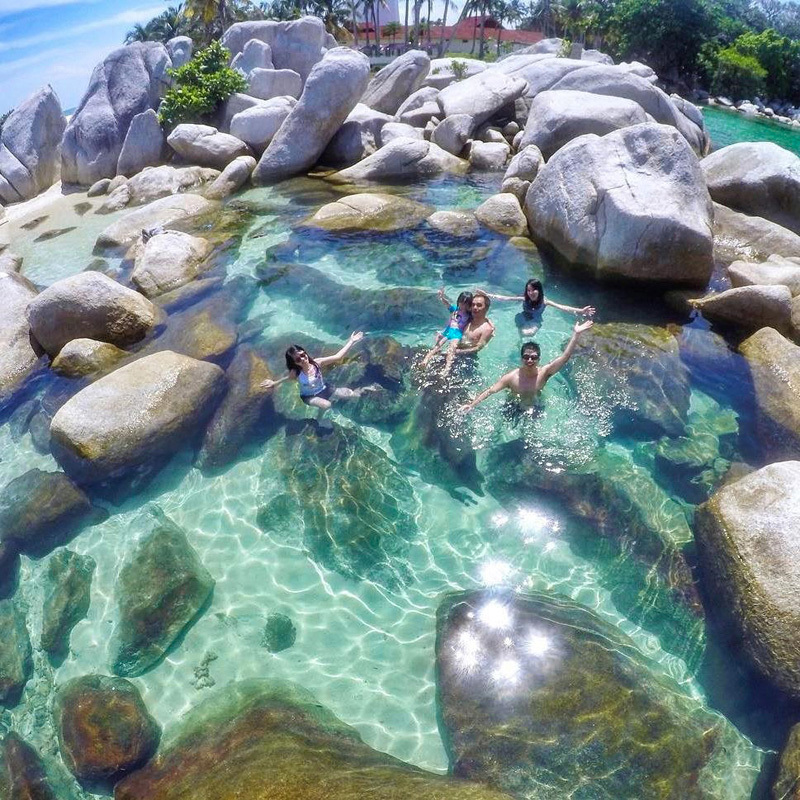 Literally any island surrounding Belitung mainland is paradisiac. Really! 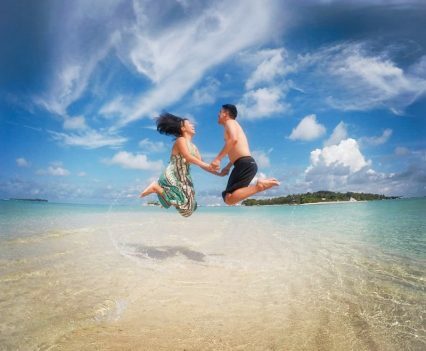 You can’t go wrong visiting them but Pulau Babi is something else – it’s so clear, you’ll almost think you are in an aquarium or on a postcard! Every 20-something should come here. Okay we take that back, everyone should come here once in their lifetime. What’s to love? 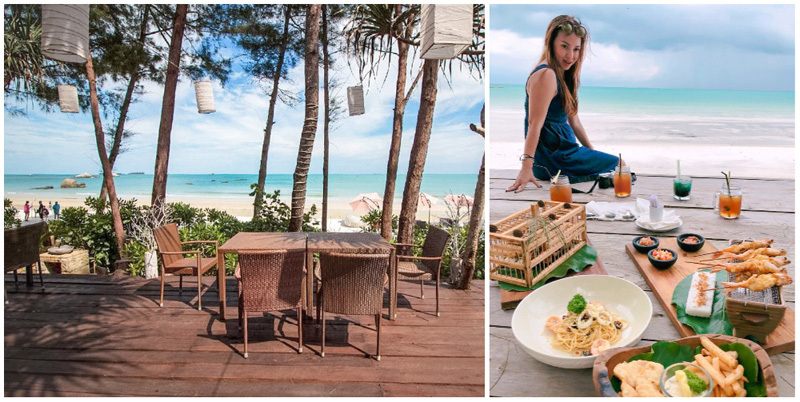 The laidback atmosphere and the bluest waters caressing the shores, as though you were on a deserted island on a TV show! 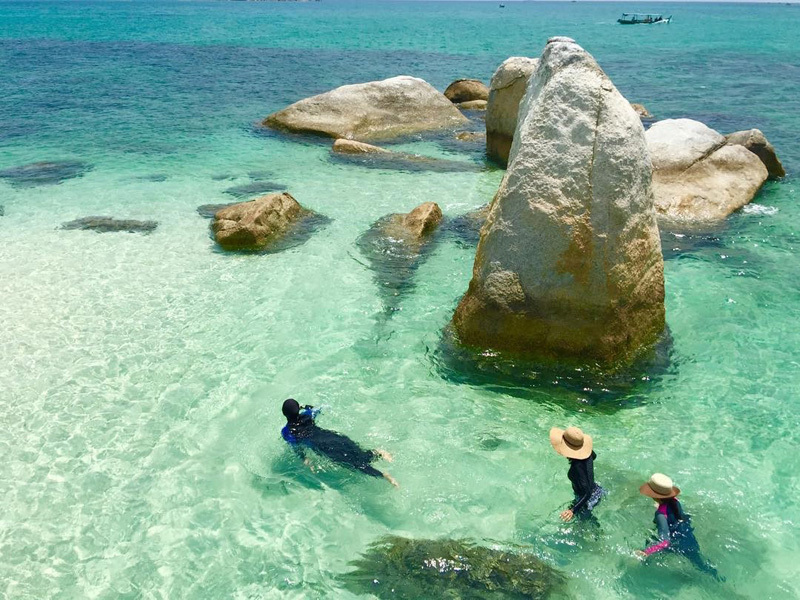 If seashells are what you usually look out for at the beach, this island is bound to upgrade your hunt to giant granite rocks! 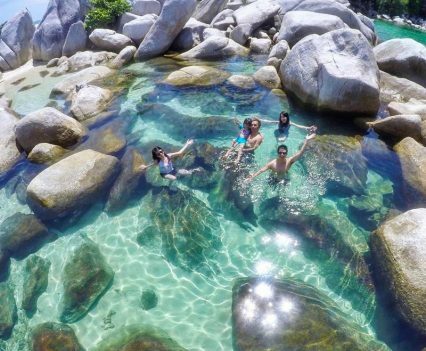 Scattered all around on the shores, these rocks are real natural phenomenon surrounded by crystal clear waters! Have fun posing and hiding behind them! 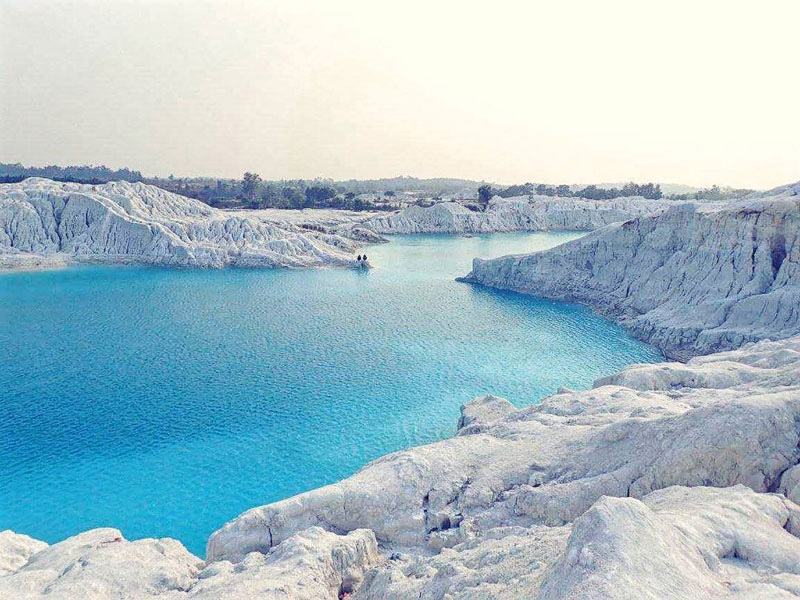 The water at Pulau Batu Garuda is the perfect shade of blue and screams “COME SWIM IN ME!”. 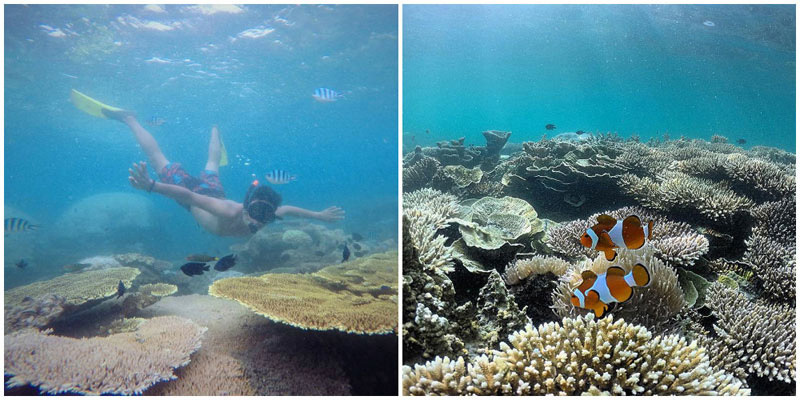 Besides its near-perfect visibility, it is home to many treasures – gardens of corals boasting in various colours hide schools of fish on their quest for some fresh algae feast. 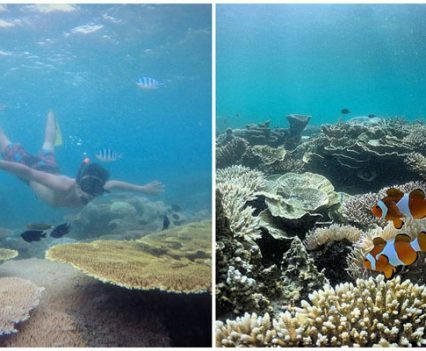 Put on your mask and fins and slip right in! 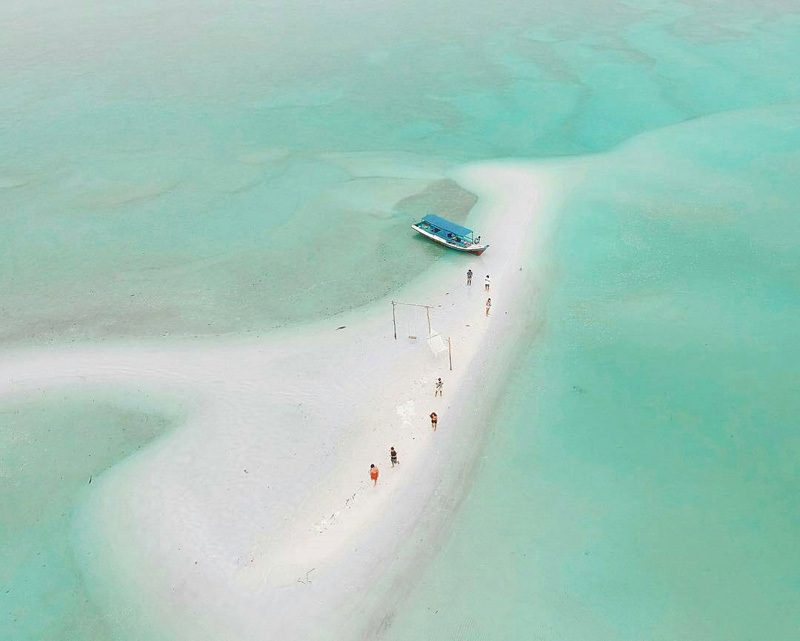 Although it is originally an island, this place has got everything to be a sandbar. 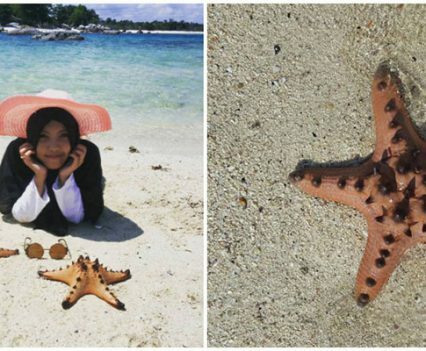 Lie in the middle of the ocean, surrounded by year-round crystal clear waters dotted by giant starfishes! Did You Know: One starfish can create another one without mating! 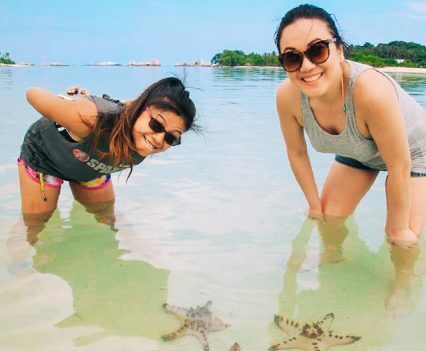 Note: Avoid taking starfishes out of water as they struggle to find their way back to the sea and often die from suffocation if left out for too long! We highly recommend not touching them as any sunscreen residue or bacteria on your hands are extremely toxic to them! 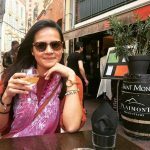 Interacting with locals helps you see things from other people’s perspective – set for sunset time at Tanjung Binga and have a chat with the local fishermen, get to know their daily lives while you relish on a sky show with hues of orange and tones of blue merging like an abstract painting. 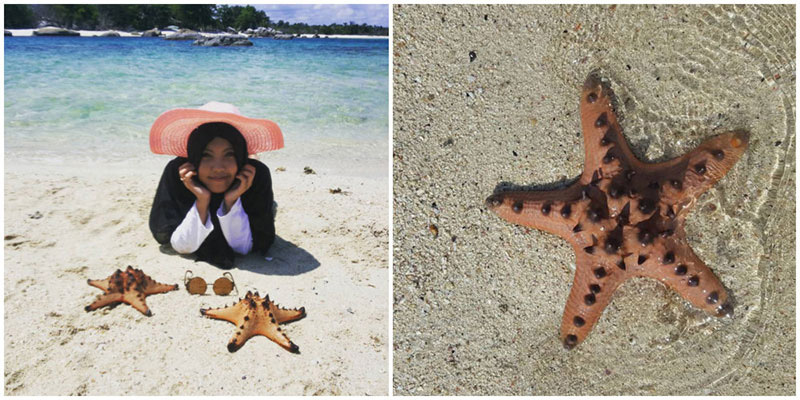 Get a taste of what it’s like living on an island close to your favourite sea creatures! 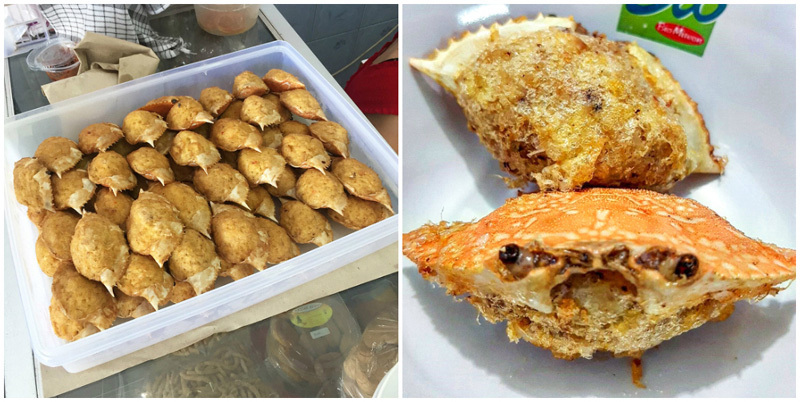 Feast on fresh crab, fish, lobster, and squid straight out of the sea at this oceanside restaurant. 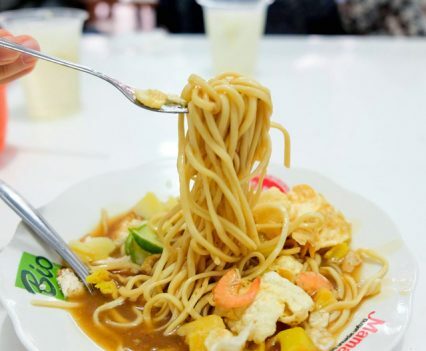 Their dishes are best accompanied with a side of sautéed vegetables and they all come at super affordable prices! 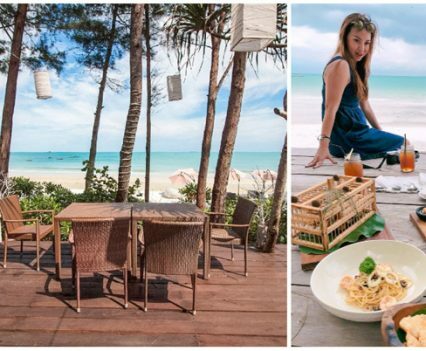 You may come for the beautiful view, but you’ll leave with dreams of lobster and freshly caught crabs; this restaurant redefines “cheap seafood by the beach”! Road trip to the East for spectacular scenery and best views! 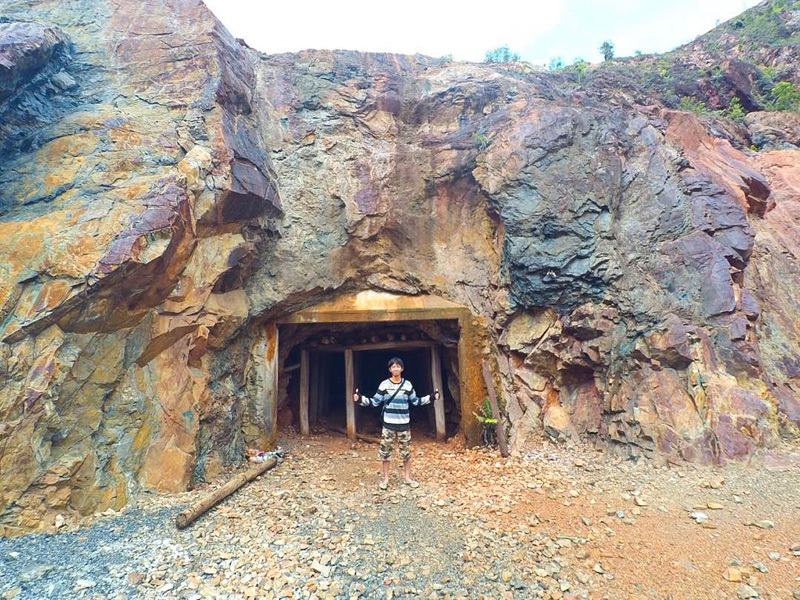 East Belitung hides a spectacular, rugged landscape where you can find the ruins of an abandoned tin mine which dates back to the ‘90s! 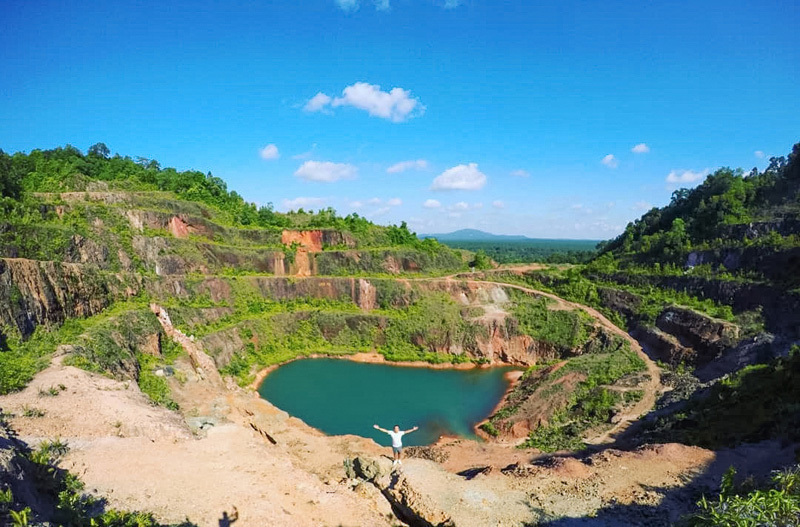 The way to the open pit is a challenging one, get ready to take a deep breath and hike up the terraces to soak in the amazing views of the greenish lake surrounded by lush flora. 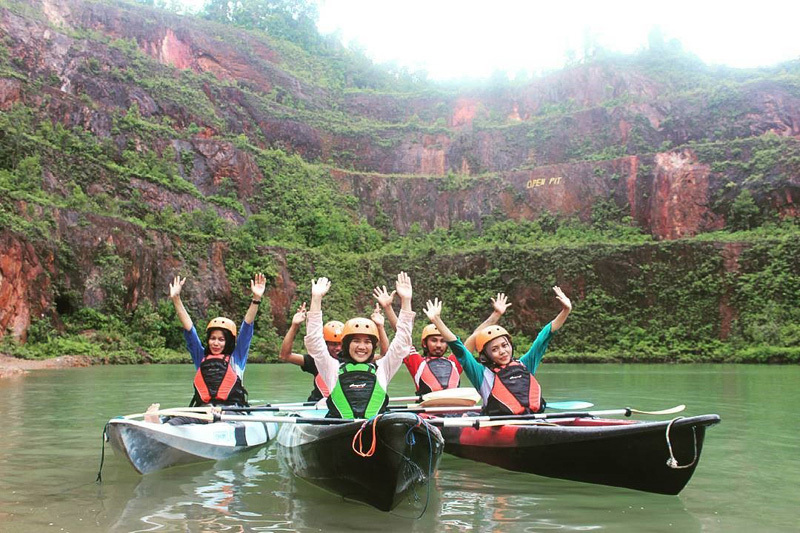 The location is best explored with the help of a tour guide who will find adequate paths to ensure a smooth experience! 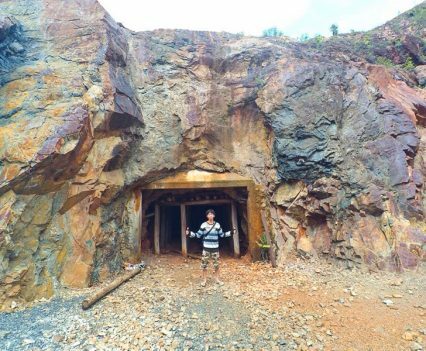 Getting there: Open Pit is in the area of Bukit Pangkuan, which is about an hour’s drive from Tanjung Pandan. 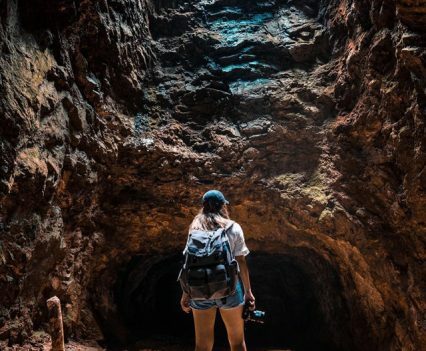 There are no signposts leading to the area, so you are encouraged to get the help of a local guide. 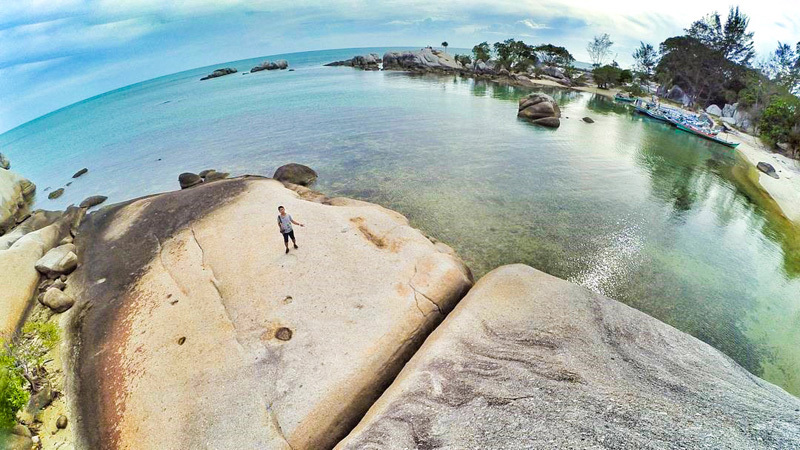 Ask true beach lovers to name a favorite swath of sea and sand in Belitung, and the answer changes with the tides. 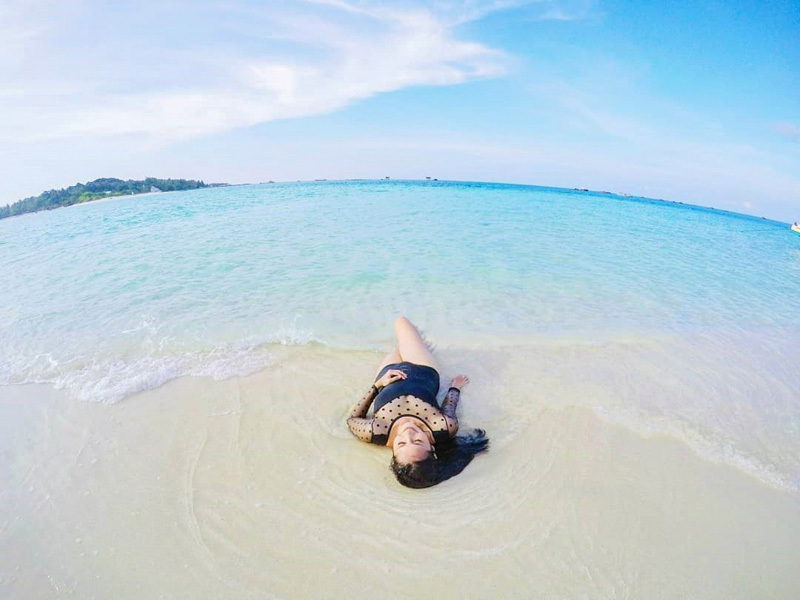 Thankfully, the island is surrounded and covered in oceans, seas, and lakes, which means there’s a beach to indulge any whim. With its multiple colourful traditional boats aligned perfectly, this beach goes unnoticed to none! 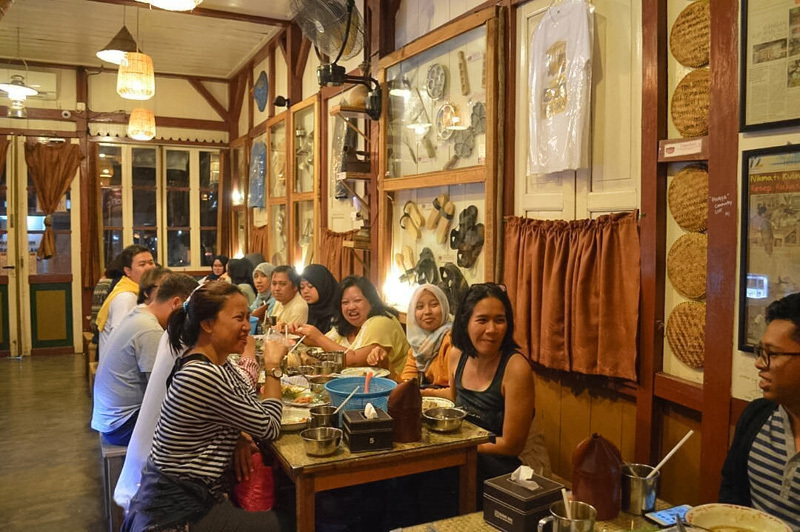 If you are keen to mingle with locals and other international visitors, drop by there for some memorable moments. Take a turn on the swing and get lost in the ocean views! Stroll along a beach walk and take a soothing dip in the clear water – it’s an awesome post-hiking remedy! 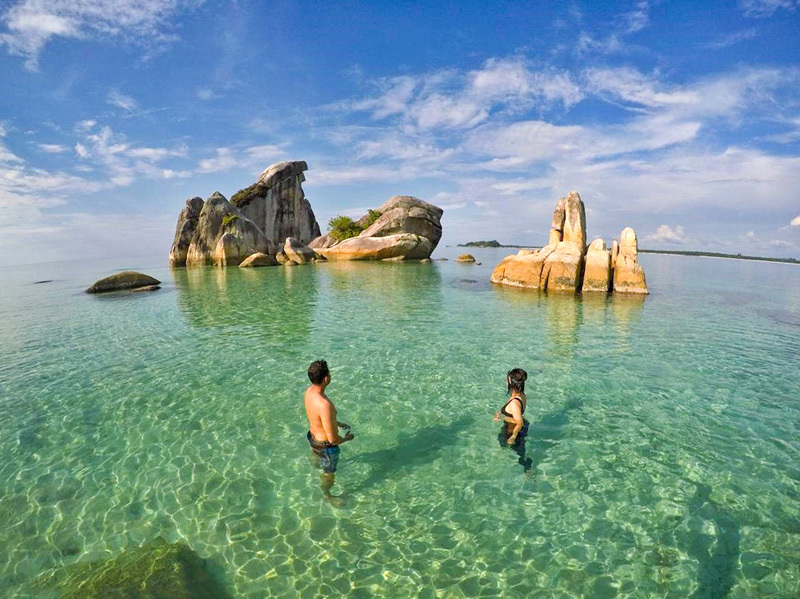 Getting there: The beach is located on East Belitung and is a 1-hour-30-minute drive from Tanjung Pandan city centre. 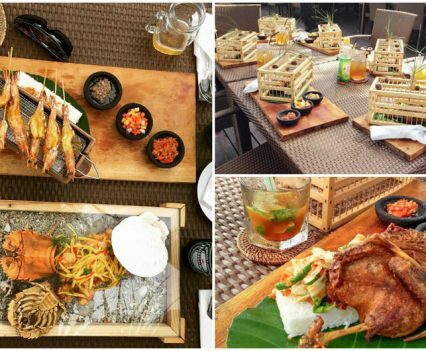 This restaurant offers the best and freshest fusion dishes with a prime ingredient – seafood! 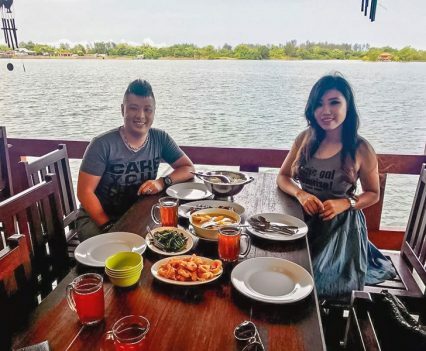 But seafood is not the only thing that Rumah Makan Fega masters, you will surely enjoy a great meal but the view does not get any better! Take in views of the stunning lake while you breathe in the delicious smell of your seafood plates getting ready. Just like dining aboard the Titanic, this restaurant is sure to satisfy more than just your stomach! 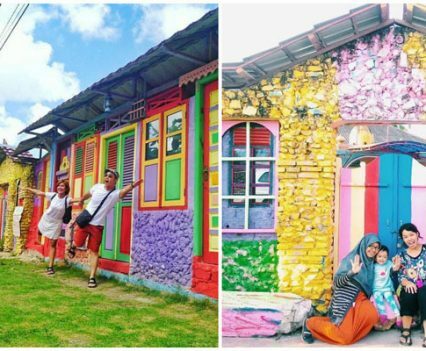 If you are not aware, the island of Belitung was first introduced to people through an incredible story known as The Rainbow Troops (a book written by Andrea Hirata in 2007). 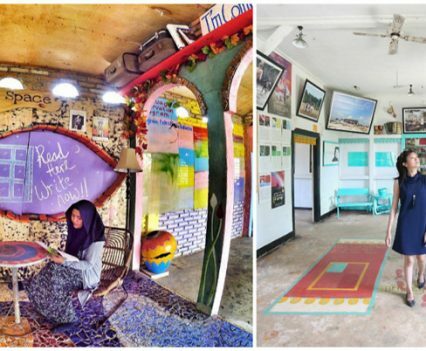 The bestseller was sold around the world with shattering records and Andrea Hirata subsequently set up a literary museum in Belitung to commemorate the success, allowing you to immerse yourself in the story! Read it and visit it, you will feel like you’ve become part of the story! 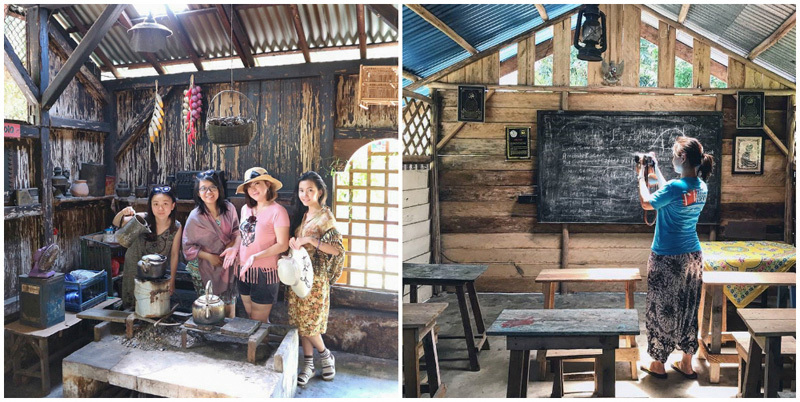 Unlike your traditional museum visit, expect an interactive one where you are bound to put your creativity into practice for the best shots! Doors on the ceiling? Why not? They open million of possibilities! P.S. 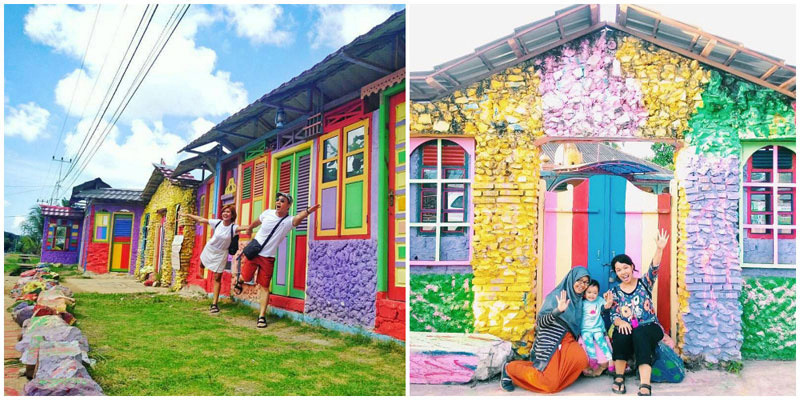 Now you know why the museum is decked in rainbow colours – blame it on the novel’s title! 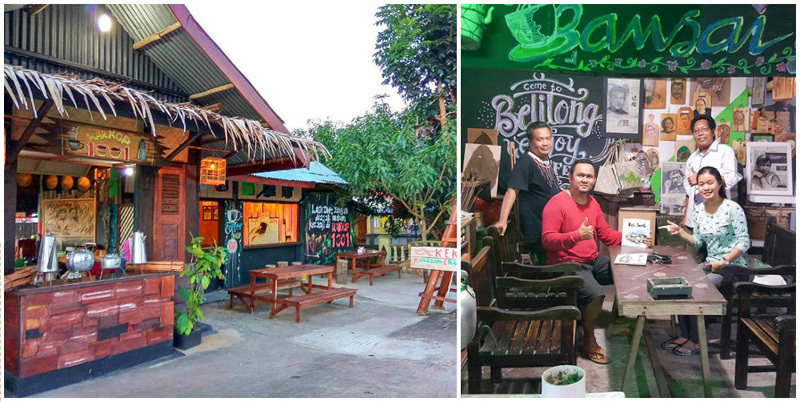 Notice that Belitung has an incredible coffee culture (blame it on their Dutch influences) and you should not miss it! 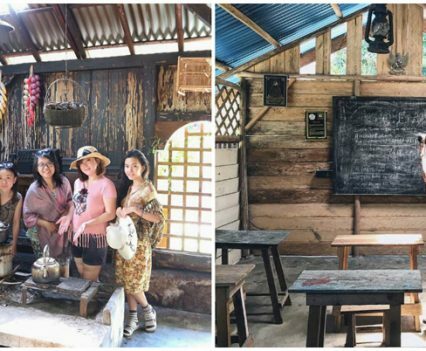 Surely, you will get an eye roll or two while fighting your way through this local coffee shop to find an empty seat but you won’t regret a tad bit when you get to sip its strong brew served at incredibly affordable prices! 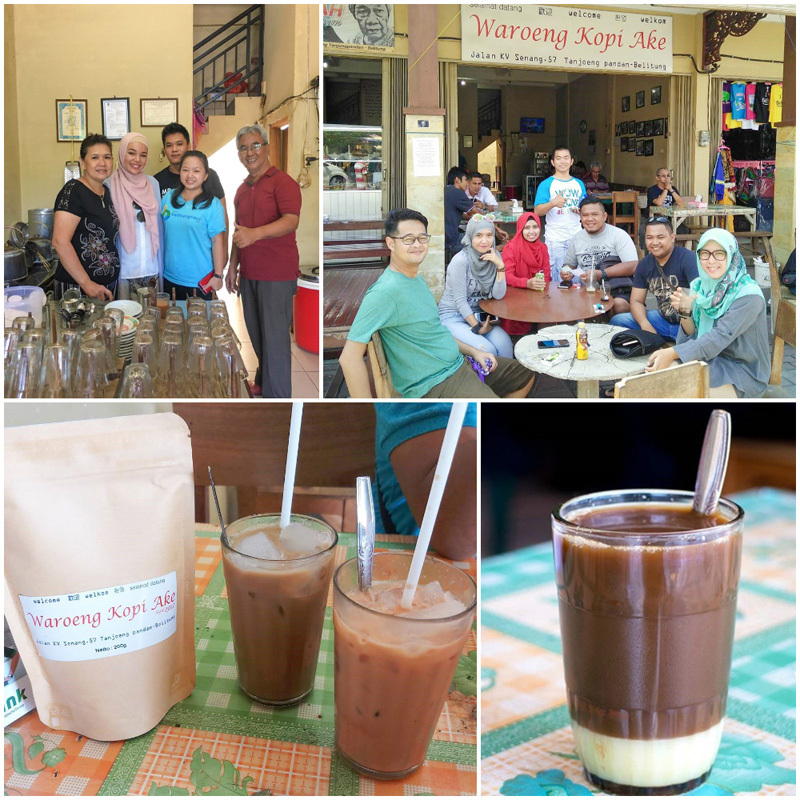 Contradictory to your usual over commercialized coffee shop chains, this coffee joint in Belitung does not serve different types of frappes or cappuccinos; what you’ll be getting is a modest warung (casual dining experience) with a choice of either black coffee or milk coffee…. 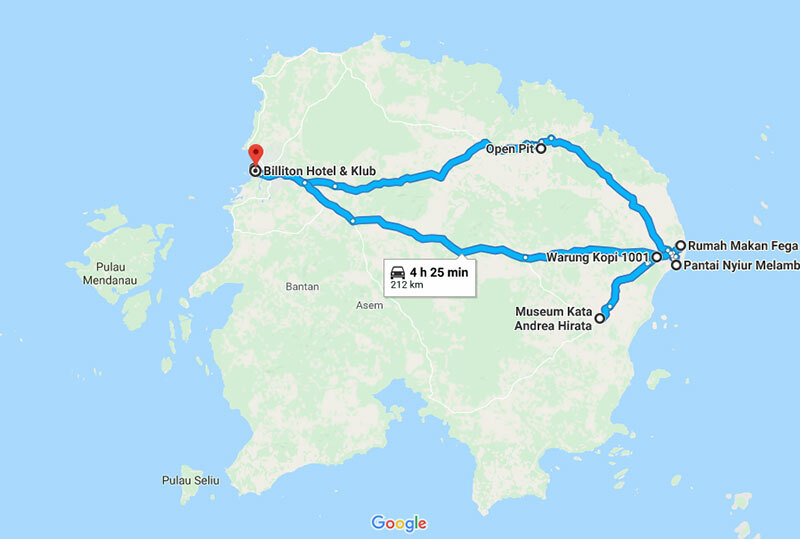 Fun fact: You won’t come across any coffee plantation in Belitung (most of the coffee beans are brought in from Lampung! ), but you will find many coffee shops around the island. There are so many of them that the town of Manggar has been nicknamed the City of 1,001 Coffee Shops! 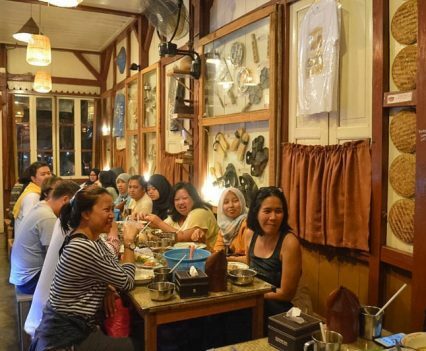 Your last night in Belitung calls for a memorable feast on traditional specialties and nowhere does it better than RM Belitong Timpo Duluk! 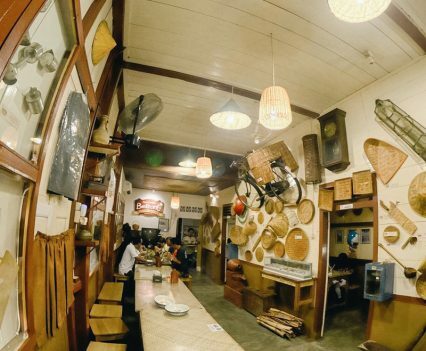 At first glance, the interior will leave you in awe as bicycles, baskets and all sort of knick knacks and antique items are scattered around, so it’s charming and welcoming for an authentic dinner experience! 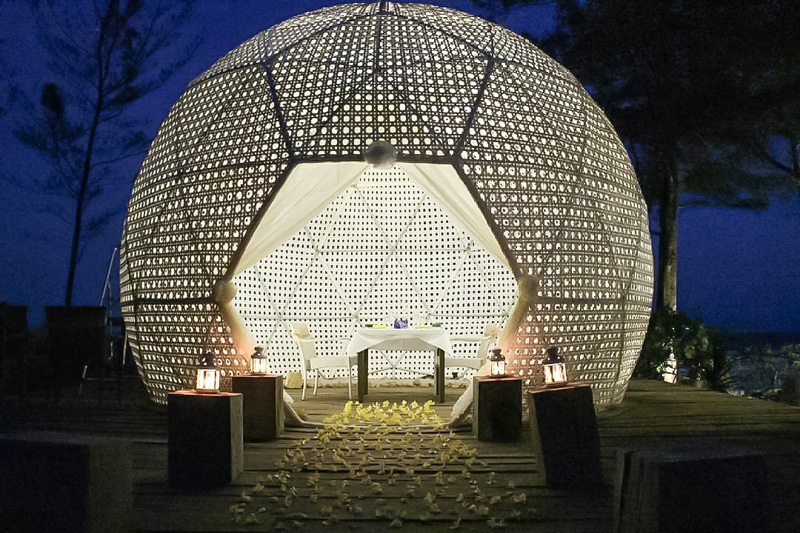 From its setting to its cuisine, you are sure to be transported to local cultures! 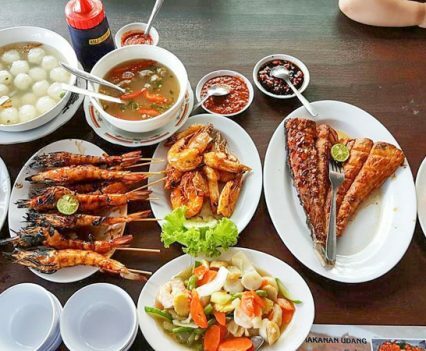 The local dining experience involves dishes being shared among a minimum of 4 people on a long table so forget about your picky tastes tonight. 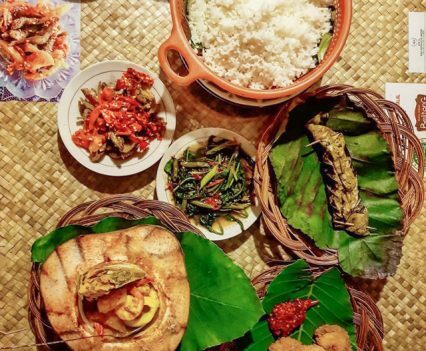 Dishes that are to-die-for are their local satays, coconut milk curries and fish soup served in a young coconut (a bomb mix of flavours!). Keen for some dose of spiciness? 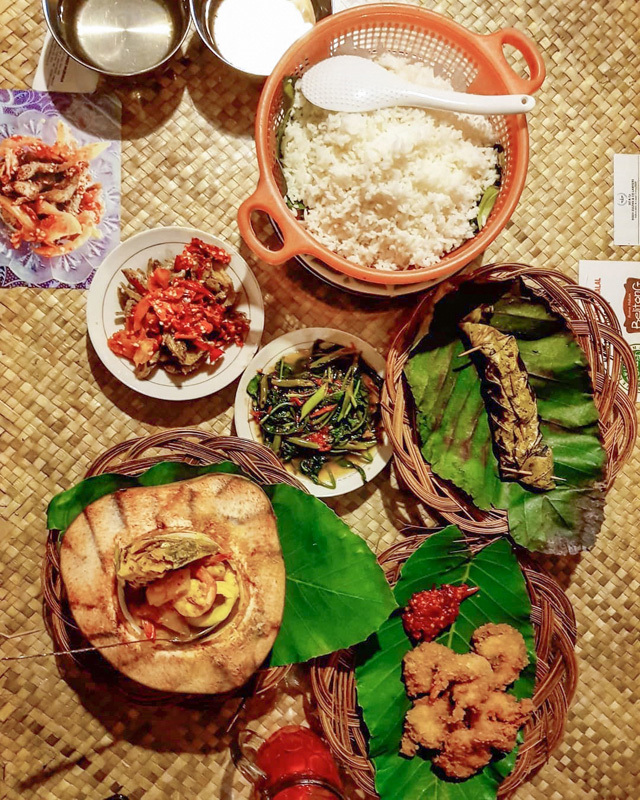 Add in their traditional sambal to tickle your palate! Souvenir shopping and a century old coffee shop stop before leaving! Take home a slice of Belitung with edible souvenirs to gift to friends and family, and fill your own kitchen cupboards! 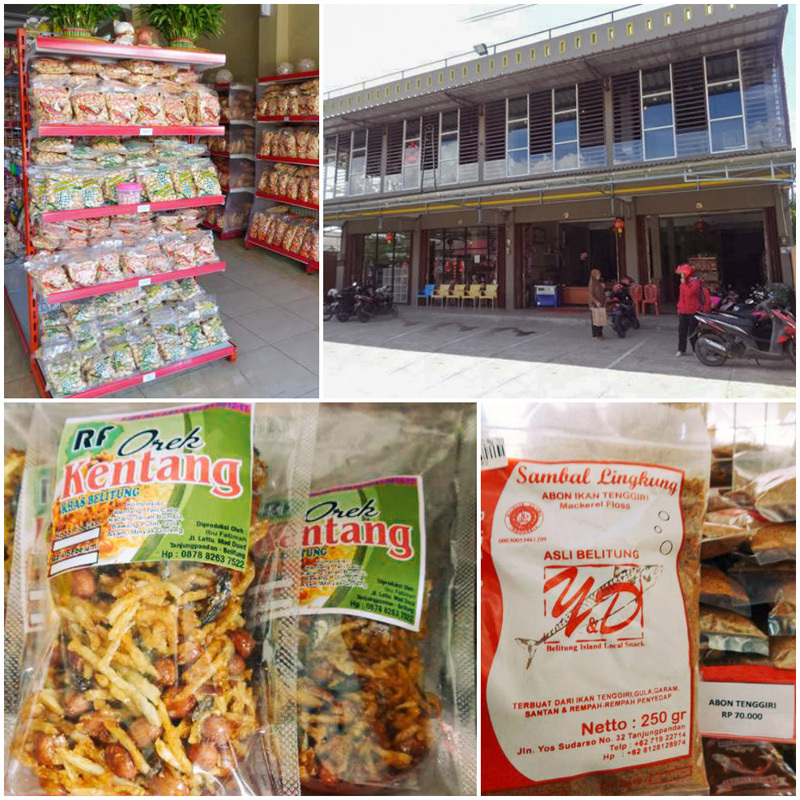 This traditional outlet offers a range of local crackers, fish floss and shrimp paste to fill your suitcase with so forget the usual tacky souvenirs this time! 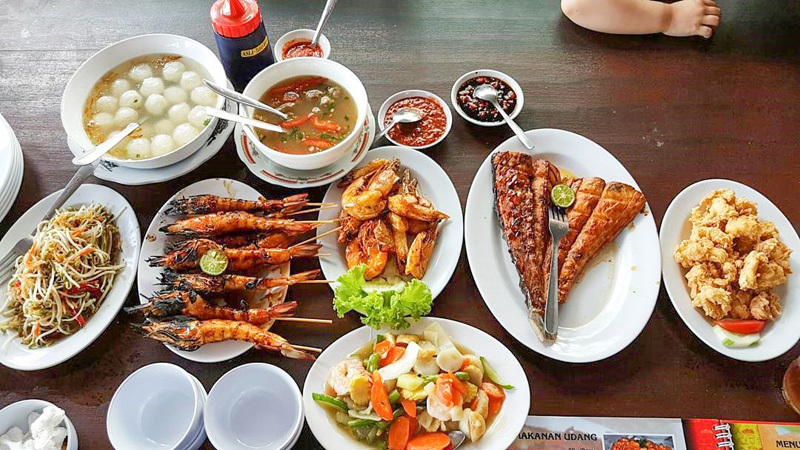 They are delectable and ripe with authentic local flavours that might get your friends to consider Belitung as their next island getaway! 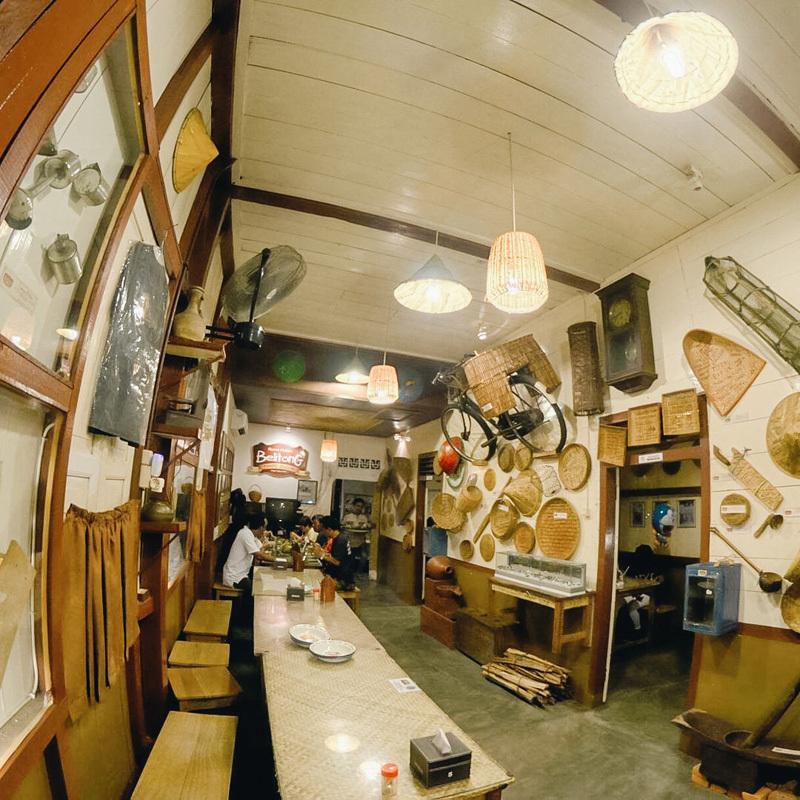 Fuel up at Waroeng Kopi Ake, a 100-year-old coffee joint! 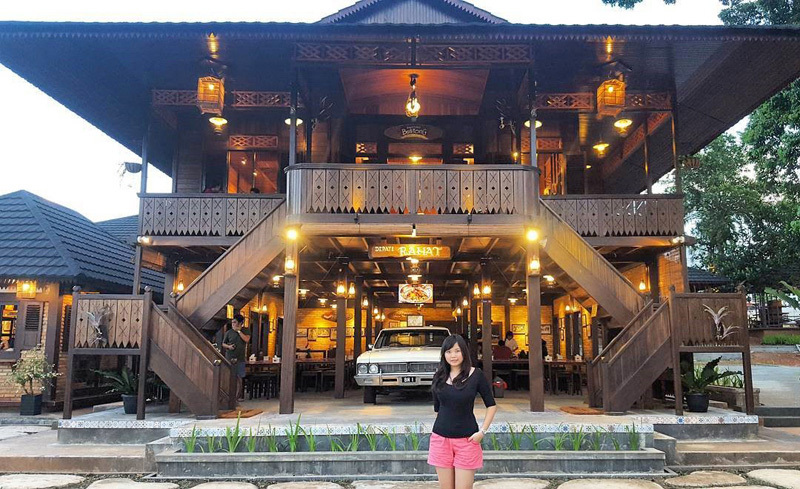 Make it a holiday ritual, start planning your next visit to Belitung at a coffee stop at Waroeng Kopi Ake! The local coffee joint has been standing proudly and serving one of the island’s best coffee for more than a century! Back in those days, young Dutch hipsters would come to the coffee house, newspaper in hand and saunter away their time, admiring one another’s get-ups, but today visitors flock to the local spot for a warm and indulging coffee boost prior to their next adventure! 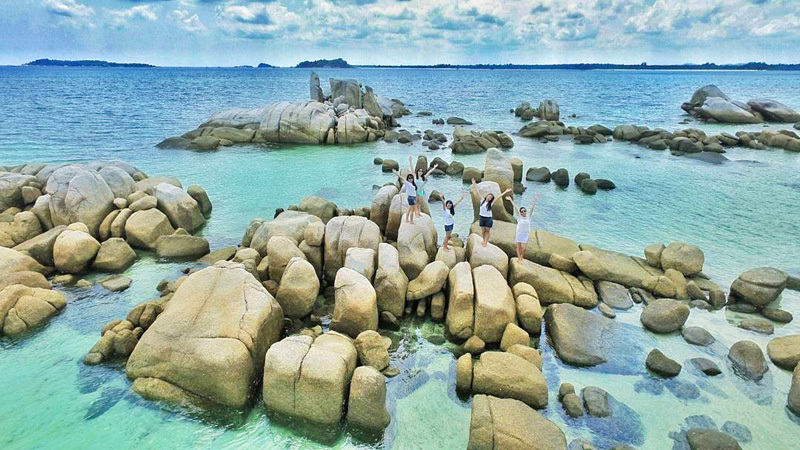 If you have enjoyed Belitung as much as we did, share this itinerary with your friends and family so they can plan a memorable holiday too! 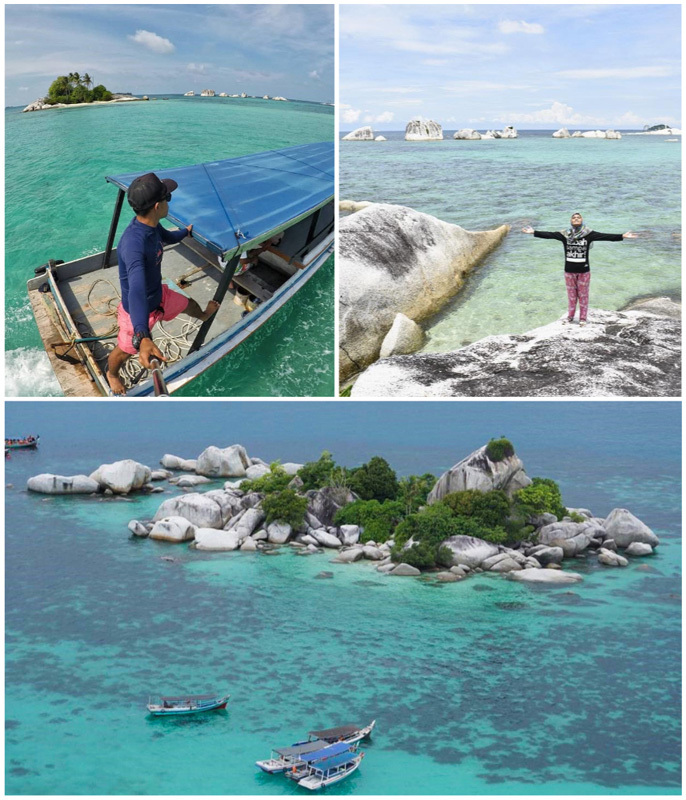 Transportation in Belitung is simple and convenient, as the island is relatively small enough so you can reach any location in less than two hours from the main town Tanjung Pandan. 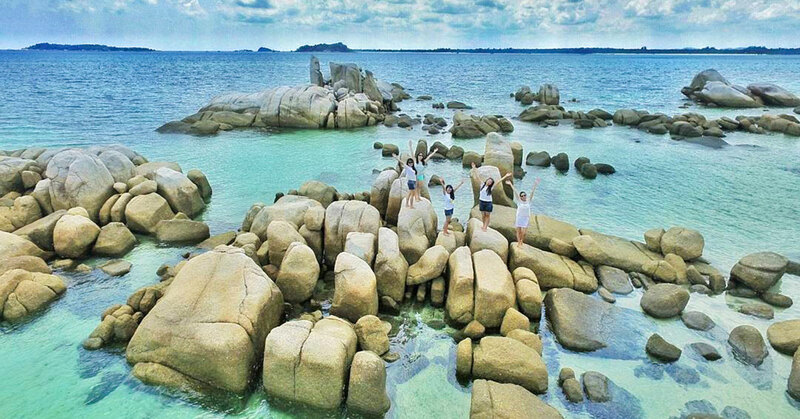 Professional service and reliable drivers are what will make your holiday in Belitung memorable. 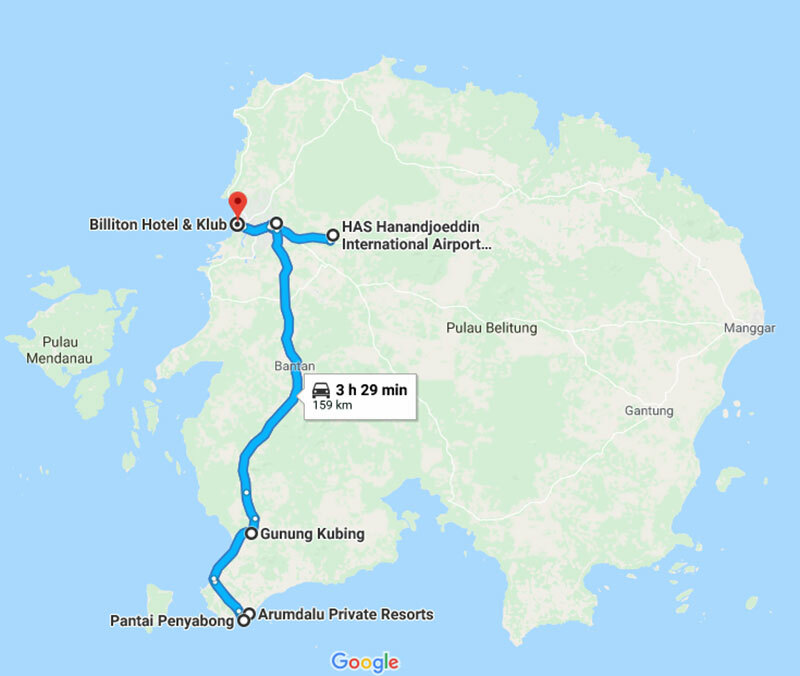 With local knowledge and hospitality, drivers from Belitung Car Rental are willing to go the extra mile for you throughout your vacation. 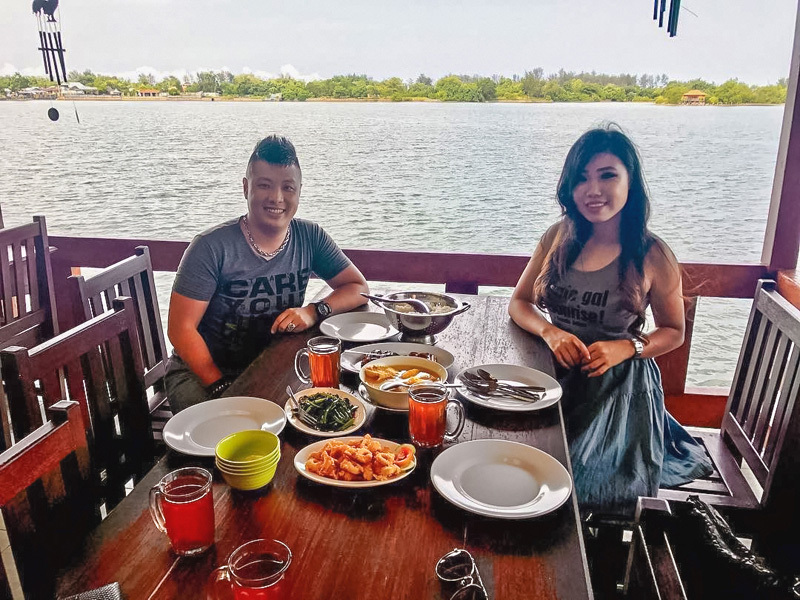 Car rental services do not include fuels costs and are charged on a 12-hour basis, giving you plenty of time to explore and learn about Belitung culture and way of life from your driver! The drivers will be more than happy to recommend you places only the locals know about, so that you can make the most out of your visit! Feeling a little adventurous and prefer driving on your own, so you can stop wherever you want without having to ask? Rent a self-drive car and be your own driver! 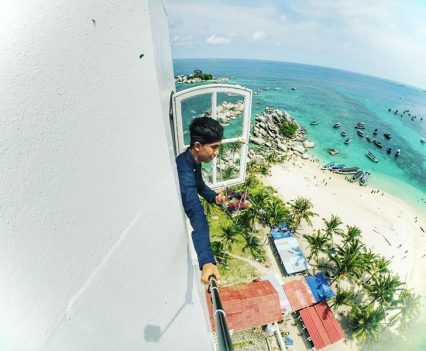 Belitung Car Rental also provides cars without driver services, so you can opt for that for ultimate flexibility and freedom! 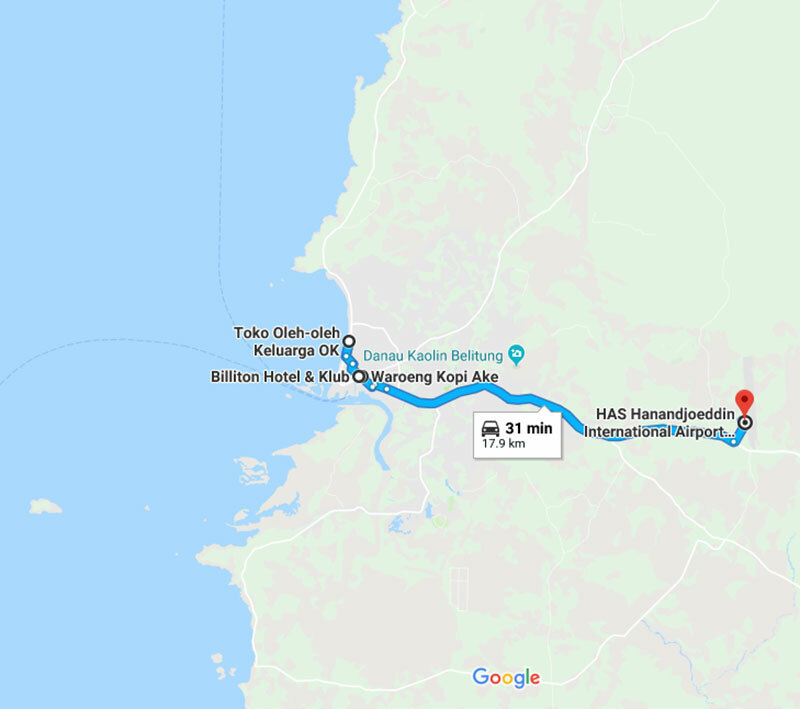 Tip: If you are unfamiliar with Indonesia’s roads, we strongly recommend you to rent a car with a driver instead, as the road conditions might be challenging to navigate, and fellow drivers on the road might not be easy to deal with! Price with driver: From Rp. 400,000 per day for car and driver only (approximately USD $28 per day). Car Rental Period expires at 9pm, and every additional hour is Rp. 40,000 after 9pm. Price without driver: Rp. 300,000 per day for car only (approximately USD $21 per day). Car Rental Period expires at 8am the next morning. 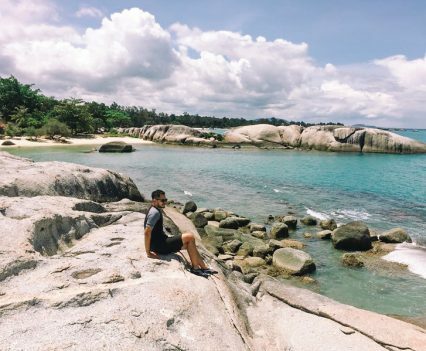 As Belitung is known for its untouched beaches, we recommend you to travel here during the dry season, which is from April till August. During this period, you can expect warm tropical weather and relatively calm seas. 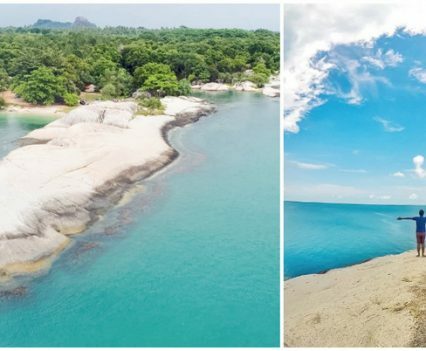 Avoid rainy seasons from October till March, as due to the high waves and strong winds during this period, you’ll not be able to enjoy the beauty of Belitung’s beaches. Do avoid Indonesian public holidays too, as you will see a lot of local tourists flocking here and the prices will increase as well. Note: Total estimated cost is not inclusive of flight tickets and shopping. 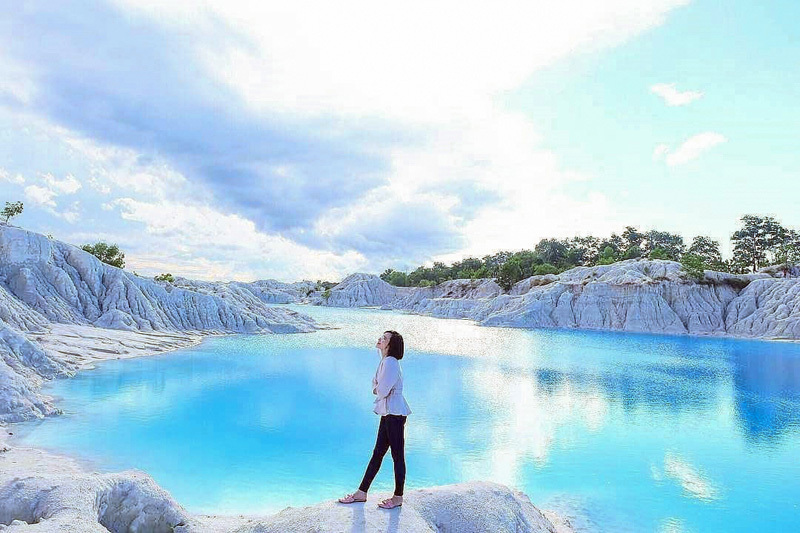 Say no to major travel burnout and skip overrated crowd craziness this holiday to freshen your bucket list with Belitung. 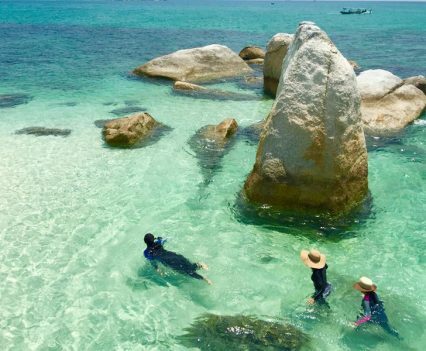 This rising destination promises great beaches where you can snorkel in, and unique natural attractions where you can bask in spectacular views! Who’s up for this out-of-the-ordinary itinerary? 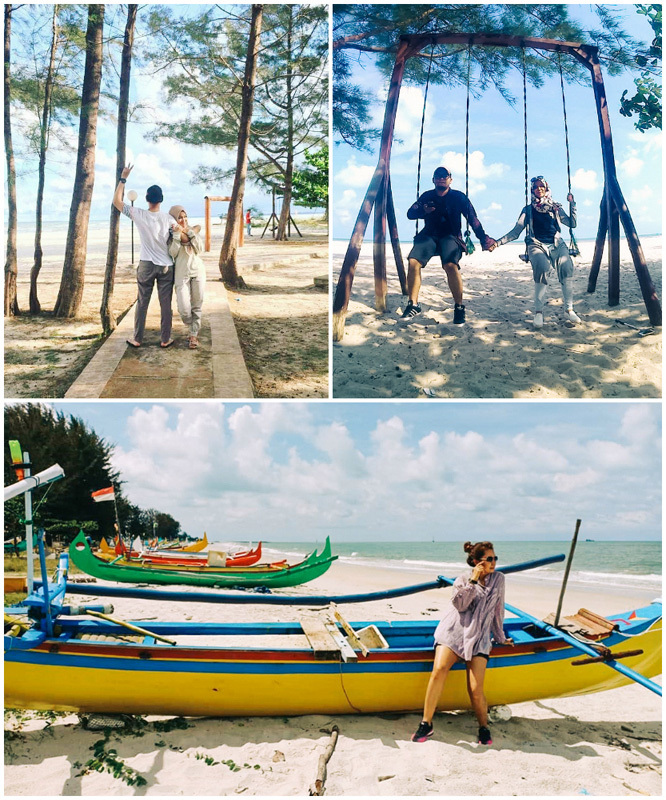 Which parts of the trip do you prefer? Comment and let us know!